15 lb 10 oz - 12 fish. 7 lb 09 oz - 5 fish. 6 lb 15 oz - 6 fish. 6 lb 05 oz - 5 fish. 5 lb 13 oz - 4 fish. 0 lb 07 oz - 1 fish. Doubles Knockout runners up - Bernard Vasey & Norman Brittain. Heaviest Fish in a competition - Andy Craig - 11 lb 04 oz. Heaviest Fish out of competition - Denis Thompson - 11 lb 04 oz. Christmas match winner - Jimmy Middlemas - 11 lb 04 oz. Greatest number of fish - Ian Russell - 192 fish. Heaviest Bag of Fish - Les Spedding - 21 lb 09 oz. 1st - Mathew Atkinson - 102 lb 03 oz - 64 fish. 2nd - Philip Kilpatrick - 67 lb 09 oz - 47 fish. Total weight for the season - 3,394 lb 0 oz. Total Number of fish - 2,149. 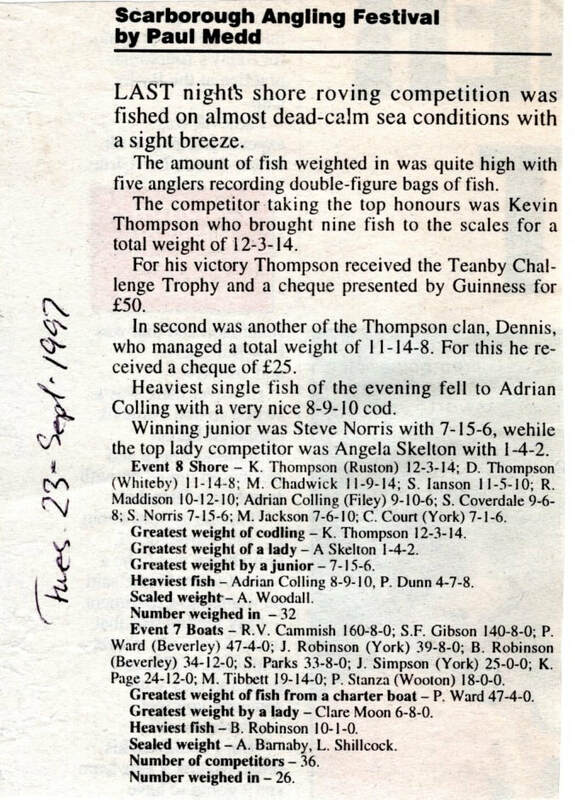 12th October 1997 - Denis Thompson Heaviest Fish - 6 lb 09 oz. 12th October 1997 - Les Spedding Heaviest Bag of Fish - 21 lb 09 oz. 12th October 1997 - Ian Russell - bag of 17 lb 08 oz - 10 fish. 12th October 1997 - Denis Thompson - bag of 19 lb 04 oz - 9 fish. 12th October 1997 - Paul Kilpatrick - bag of 10 lb 13 oz - 4 fish. 12th October 1997 - Philip Kilpatrick (Jnr) - bag of 7 lb 06 oz - 5 fish. 26th October 1997 - Denis Thompson Heaviest Fish - 7 lb 06 oz, part of a 16 lb 10 oz bag of 8 fish. 26th October 1997 - Ian Russell bag of 14 lb 03 oz - 10 fish. 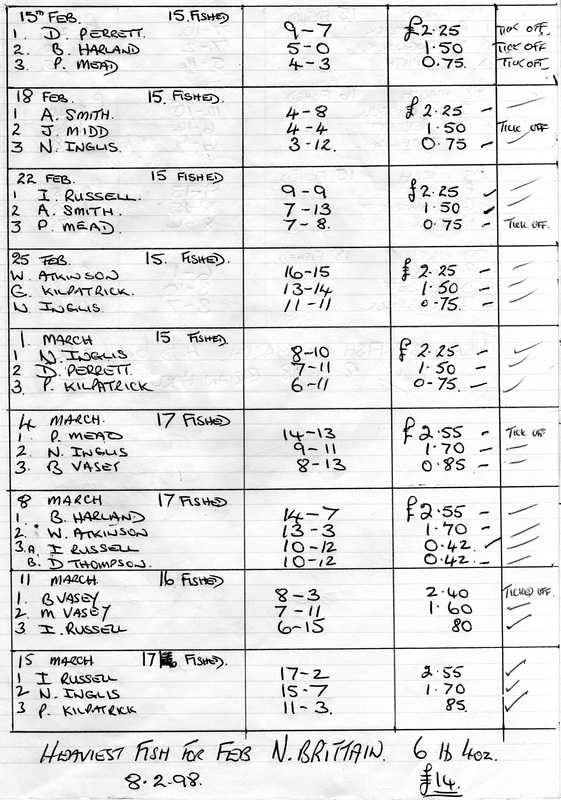 26th October 1997 - Neil Inglis bag of 12 lb 0 oz - 6 fish. 26th October 1997 - George Middlemas bag of 13 lb 0 oz - 10 fish. 2nd November 1997 - Adrian Craig Heaviest Fish - 5 lb 6 oz, part of a bag of 13 lb 07 oz - 5 fish. 2nd November 1997 - Les Spedding Heaviest bag of Fish - 14 lb 10 oz. 16th November 1997 - Norman Brittain Heaviest Fish - 6 lb 15 oz, part of a 15 lb 03 oz bag of 4 fish. 3rd December 1997 - Mathew Atkinson (Jnr) Heaviest Fish - 6 lb 01 oz, part of an 8 lb 05 oz bag of 3 fish. 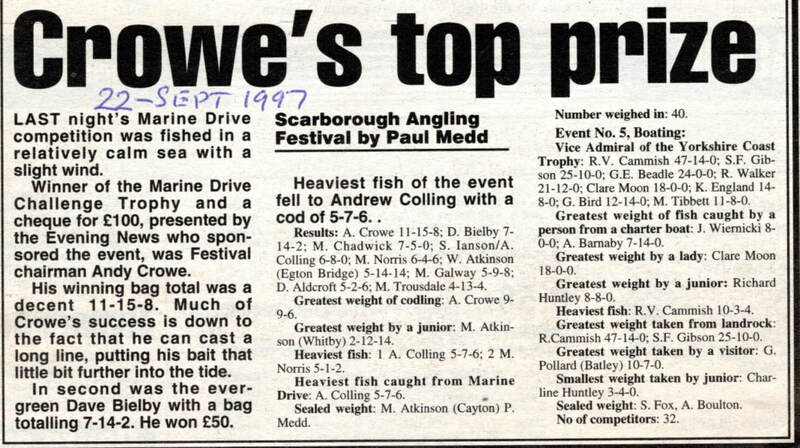 14th December 1997 - Adrian Craig Heaviest Fish - 11 lb 01 oz. 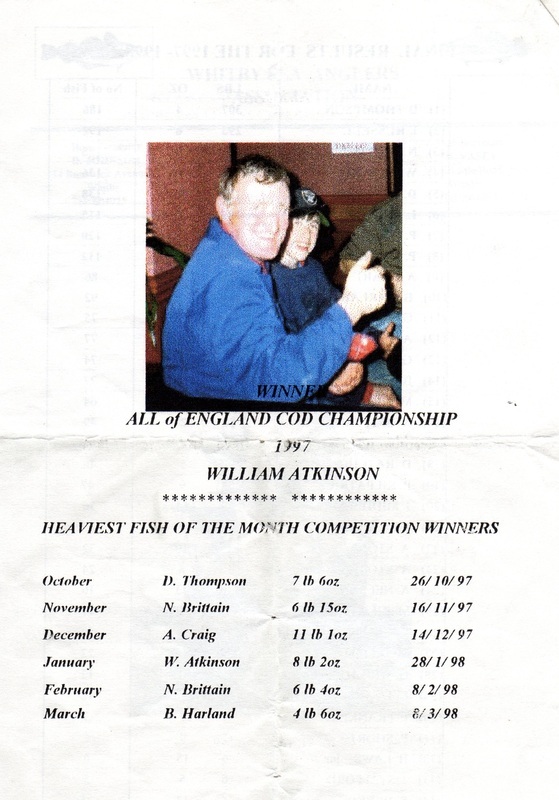 4th January 1998 - William Atkinson Heaviest Fish - 6 lb 13 oz. 18th January 1998 - Mathew Atkinson (Jnr) Heaviest bag of Fish - 9 lb 12 oz - 5 fish (Ship Inn Open). 28th January 1998 - William Atkinson Heaviest Fish - 8 lb 02 oz, part of a 14 lb 08 oz bag of 4 fish. 8th February 1998 - Norman Brittain Heaviest Fish - 6 lb 04 oz, part of a 12 lb 09 oz bag of 4 fish. 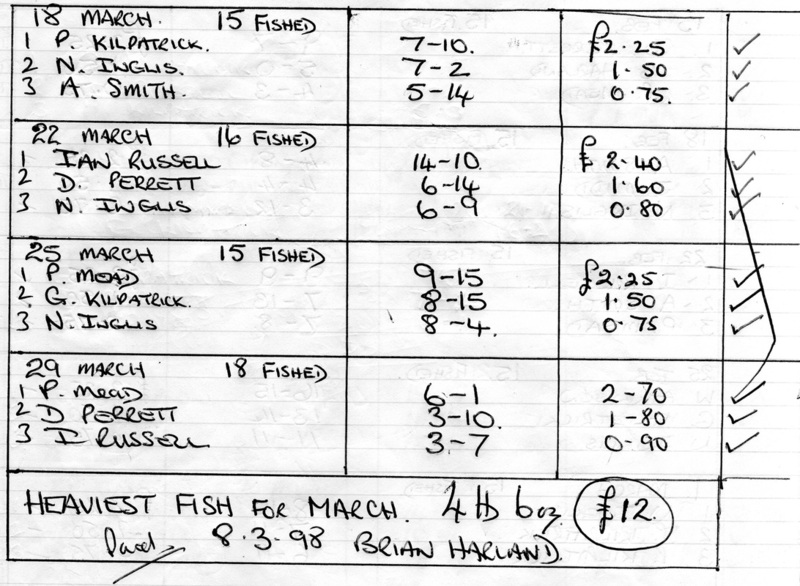 4th March 1998 - Brian Harland Heaviest Fish - 4 lb 06 oz, part of a 14 lb 07 oz bag of 4 fish. 18 members weighed in (no indication as to how many entered). 11 lb 4/16oz - 5 fish. 7 lb 10/16oz - 4 fish. 6 lb 9/16oz (HF 4 lb 03 oz) - 2 fish. 6 lb 5/16oz - 4 fish. 5 lb 12/16oz - 4 fish. 4 lb 9/16oz - 4 fish. 3 lb 12/16oz - 2 fish. 2 lb 12/16oz - 2 fish. 2 lb 8/16oz - 2 fish. 2 lb 7/16oz - 2 fish. 2 lb 2/16oz - 2 fish. 1 lb 15/16oz - 2 fish. 1 lb 14/16oz - 1 fish. 1 lb 7/16oz - 1 fish. 1 lb 6/16oz - 1 fish. 66 lb 06 oz Total weigh in. 21 members entered and 20 weighed in. 21 lb 4/16oz - 6 fish. 18 lb 6/16oz - 8 fish. 15 lb 10/16oz - 8 fish. 10 lb 5/16oz - 6 fish. 9 lb 12/16oz - 5 fish. 8 lb 1/16oz - 4 fish. 8 lb 00 oz - 4 fish. 6 lb 15/16oz - 2 fish. 6 lb 4/16oz - 4 fish. 6 lb 3/16oz - 4 fish. 4 lb 11/16oz - 2 fish. 4 lb 1/16oz - 3 fish. 3 lb 8/16oz - 2 fish. 2 lb 6/16oz - 1 fish. 155 lb 02 oz Total clubs weigh in. 1st February 1998 - as reported by Bernard Vasey to the Whitby Gazette. 1 lb 15 oz - 2 fish. 1 lb 2 oz - 2 fish. 1 lb 01 oz - 1 fish. Wednesday 1st October 1997 - Match 1. On a fine night Whitby Sea Anglers assembled at the Band Stand at 6.30pm to set off the 1997-1998 shore angling season. There was a good turn-out with some new members joining the six months winter months sports fishing (fishing to the end of march 1998). At the end of the 3 hr match fishing a calm sea there were a total of 34 fish returned to the scales as anglers reported having an active night with small fish bites which reflected in the weights. 1st - Denis Thompson - 7 lb 09 oz - 6 fish. 2nd - Les Spedding - 4 lb 15 oz - 5 fish. 3rd - Brian Harland - 4 lb 08 oz - 4 fish. 4th - Phil Mead - 3 lb 14 oz - 3 fish. 5th - Neil Inglis - 2 lb 15 oz - 2 fish. 6th - Andrew Craig - 2 lb 08 oz - 2 fish. 7th - John Butler - 2 lb 06 oz - 2 fish. 8th = Adrian Smith - 2 lb 02 oz - 2 fish. 8th = Adam Storr (Jnr) - 2 lb 02 oz - 2 fish. 10th - Ian Russell - 2 lb 00 oz - 2 fish. 11th - Glen Kilpatrick - 2 lb 00 oz - 2 fish. 12th - Norman Brittain - 1 lb 02 oz - 1 fish. 13th - Dave Perrett - 1 lb 00 oz - 1 fish. Sunday 5th October 1997 - Match 2. Similar codling as Wednesday with a total of 36 fish weighed in. 1st - Les Spedding - 11 lb 10 oz - 8 fish. 2nd - Brian Harland - 10 lb 07 oz - 6 fish. 3rd - Ian Russell - 8 lb 00 oz - 7 fish. 4th - George Middlemas - 4 lb 10 oz - 3 fish. 5th - Neil Inglis - 4 lb 10 oz - 3 fish. 6th - Denis Thompson - 2 lb 12 oz - 3 fish. 7th - Bernard Vasey - 2 lb 09 oz - 2 fish. 8th - William Atkinson - 1 lb 11 oz - 1 fish. 9th - S Wink (Jnr) - 1 lb 02 oz - 1 fish. 10th = Perry Franklin (Jnr) - 1 lb 01 oz - 1 fish. 10th = Dave Perrett - 1 lb 01 oz - 1 fish. 12th - Mathew Atkinson (Jnr) - 0 lb 14 oz - 1 fish. The majority of fish weighed in were small codling taking fresh and frozen peeler baits with a cocktail of mussel or worm. Wednesday 8th October 1997 - Match 3. The calm codling continued as anglers started fishing with 2 hrs left of a flooding tide and the results were as expected with only 24 fish weighed in. 1st - Denis Thompson - 5 lb 08 oz - 4 fish. 2nd - Les Spedding - 3 lb 09 oz - 3 fish. 3rd - Ian Russell - 3 lb 03 oz - 3 fish. 4th - Neil Inglis - 2 lb 11 oz - 2 fish. 5th - Brian Harland - 2 lb 09 oz - 2 fish. 6th - George Middlemas - 1 lb 05 oz - 1 fish. 7th - Paul Kilpatrick - 1 lb 04 oz - 1 fish. 8th = Norman Brittain - 1 lb 00 oz - 1 fish. 9th = Graham Wright - 1 lb 00 oz - 1 fish. 10th - Arthur Storr - 0 lb 15 oz - 1 fish. 11th = John Butler - 0 lb 14 oz - 1 fish. 11th = Dave Perrett - 0 lb 14 oz - 1 fish. 13th - Glen Kilpatrick - 0 lb 13 oz - 1 fish. 14th - Bernard Vasey - 0 lb 09 oz - 1 fish. 15th - M Hayes - 0 lb 05 oz - 1 fish. Sunday 12th October 1997 - Match 4. The first rough swell from a north westerly sea lead to a good turn-out of Whitby Sea Anglers members to fish a low water ebbing to flooding tide. They were spread from Staithes to Robinhoods bay scars, and produced 115 to the scales. Even with a rough sea swell, small codling were again dominant with two heaviest fish landed were 6 lb 09 oz Denis Thompson and 6 lb 08 oz Mike Kilpatrick. The total weigh in was 178 lb 14 oz. 1st - Les Spedding - 21 lb 09 oz - 15 fish. 2nd - Denis Thompson - 19 lb 04 oz - 9 fish. 3rd - Ian Russell - 17 lb 08 oz - 10 fish. 4th - George Middlemas - 12 lb 04 oz - 8 fish. 5th - Mike Kilpatrick - 10 lb 13 oz - 4 fish. 6th - James Gilpin - 9 lb 05 oz - 4 fish. 7th - Norman Brittain - 8 lb 04 oz - 6 fish. 8th - Mike Gilpin - 8 lb 04 oz - 5 fish. 9th - Dave Perrett - 7 lb 07 oz - 6 fish. 10th - Adrian Nelson - 7 lb 06 oz - 4 fish. 11th - Philip Kilpatrick (Jnr) - 7 lb 06 oz - 5 fish. 12th - Paul Kilpatrick - 6 lb 15 oz - 5 fish. 13th - Andrew Craig - 6 lb 12 oz - 3 fish. 14th - Neil Inglis - 6 lb 12 oz - 5 fish. 15th - Dave Batchelor - 5 lb 02 oz - 4 fish. 16th - Phil Mead - 4 lb 10 oz - 4 fish. 17th - Glen Kilpatrick - 3 lb 13 oz - 3 fish. 18th - William Atkinson - 3 lb 00 oz - 3 fish. 19th - Bernard Vasey - 2 lb 10 oz - 2 fish. 20th - Mathew Atkinson (Jnr) - 1 lb 15 oz - 2 fish. 21st - Arthur Storr - 1 lb 15 oz - 1 fish. 22nd - Chris Evans - 1 lb 03 oz - 1 fish. 23rd - Geoff Stafford - 1 lb 02 oz - 1 fish. 24th - Mike Vasey - 1 lb 00 oz - 1 fish. 25th - Brian Harland - 0 lb 15 oz - 1 fish. 26th - Adrian Smith - 0 lb 14 oz - 1 fish. 27th - Adam Storr (Jnr) - 0 lb 13 oz - 1 fish. 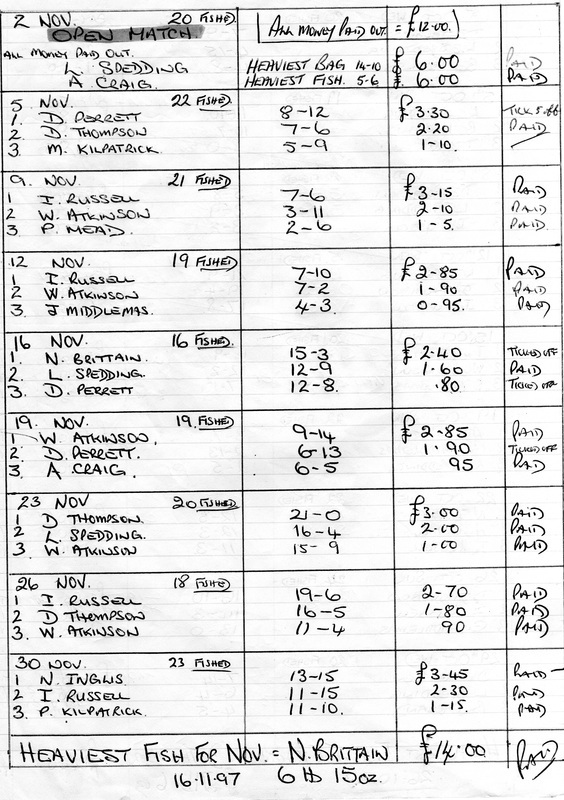 Whitby Open Match 2nd November 1997. Wednesday 15th October 1997 - Match 5. Last nights match gave a good south by south easterly swell with anglers fishing an ebbing tide on the scars. The fish were again a catch of small codling, 50 fish to the scales, with billets still not making their early annual winter appearance in numbers. 1st - Ian Russell - 18 lb 09 oz - 7 codling. 2nd - William Atkinson - 12 lb 02 oz - 7 fish. 3rd - George Middlemas - 7 lb 10 oz - 5 fish. 4th - Brian Harland - 7 lb 09 oz - 5 fish. 5th - Dave Perrett - 5 lb 11 oz - 5 fish. 6th - Paul Short - 5 lb 10 oz - 4 fish. 7th - Neil Inglis - 5 lb 07 oz - 3 fish. 8th - Norman Brittain - 4 lb 10 oz - 4 fish. 9th - Phil Mead - 4 lb 07 oz - 4 fish. 10th - Glen Kilpatrick - 4 lb 05 oz - 3 fish. 11th - John Butler - 4 lb 02 oz - 2 fish. 12th - Denis Thompson - 3 lb 06 oz - 3 fish. 13th - Mathew Atkinson (Jnr) - 2 lb 15 oz - 2 fish. 14th - Stuart Wink (Jnr) - 2 lb 14 oz - 1 fish. 15th - Mike Vasey - 1 lb 07 oz - 1 fish. 16th - Paul Kilpatrick - 0 lb 14 oz - 1 fish. Sunday 19th October 1997 - Match 6. Sunday evenings match resulted in only 14 fish weighed in after 4 hours of fishing, eleven codling , 2 billets and 1 rockling. There was a north easterly slight swell and a 5.7 metre high tide with anglers fishing their cliff top marks. The nights winner was Adrian Smith, 2 fish for - 3 lb 07 oz. 1st - Adrian Smith - 3 lb 07 oz - 2 fish. 2nd - George Middlemas - 2 lb 13 oz - 2 fish. 3rd - Les Spedding - 2 lb 05 oz - 2 fish. 4th - Paul Kilpatrick - 1 lb 13 oz - 2 fish. 5th - Denis Thompson - 1 lb 11 oz - 1 fish. 6th - Neil Inglis - 1 lb 06 oz - 1 fish. 7th - Bernard Vasey - 1 lb 04 oz - 1 fish. 8th - Dave Perrett - 1 lb 00 oz - 1 fish. 9th - Philip Kilpatrick (Jnr) - 0 lb 15 oz - 1 fish. 10th - Mike Gilpin - 0 lb 13 oz - 1 fish. Wednesday 22nd October 1997 - Match 7. The north by north westerly swells continued and with these some bigger fish and 3 double figure bags. A total of 65 fish were weighed in. 1st - Neil Inglis - 12 lb 05 oz - 7 fish. 2nd - Andrew Craig - 12 lb 03 oz - 6 fish. 3rd - Ian Russell - 11 lb 03 oz - 9 fish. 4th - Phil Mead - 6 lb 12 oz - 4 fish. 5th - Glen Kilpatrick - 5 lb 14 oz - 3 fish. 6th - Dave Perrett - 5 lb 09 oz - 5 fish. 7th - Paul Kilpatrick - 5 lb 03 oz - 4 fish. 8th - Adrian Smith - 5 lb 00 oz - 2 fish. 9th - George Middlemas - 4 lb 14 oz - 3 fish. 10th - William Atkinson - 4 lb 13 oz - 4 fish. 11th - Jimmy Middlemas - 4 lb 08 oz - 3 fish. 12th - Brian Harland - 3 lb 14 oz - 3 fish. 13th - James Gilpin - 3 lb 05 oz - 3 fish. 14th - Denis Thompson - 2 lb 15 oz - 2 fish. 15th - Dave Batchelor - 2 lb 11 oz - 2 fish. 16th - Les Spedding - 2 lb 10 oz - 2 fish. 17th - John Butler - 1 lb 12 oz - 1 fish. 18th - Ben Laws (Jnr) - 1 lb 02 oz - 1 fish. 19th - Perry Franklin (Jnr) - 1 b 00 oz - 1 fish. Sunday 26th October 1997 - Match 8. A southerly swell produced more double figure bags and the presence of bigger fish as 3 lb and 4 lb fish were brought to the scales. The heaviest fish of the month fell to Denis Thompson with a 7 lb 06 oz cod. 88 fish were weighed in for over 130 lb. 1st - Denis Thompson - 16 lb 10 oz - 8 fish, including one of 7 lb 06 oz. 2nd - Ian Russell - 14 lb 03 oz - 10 fish. 3rd - George Middlemas - 13 lb 00 oz - 10 fish. 4th - Neil Inglis - 12 lb 00 oz - 6 fish. 5th - Brian Harland - 9 lb 08 oz - 9 fish. 6th - Les Spedding - 9 lb 01 oz - 5 fish. 7th - William Atkinson - 8 lb 15 oz - 6 fish. 8th - Norman Brittain - 8 lb 03 oz - 5 fish. 9th - Bernard Vasey - 6 lb 09 oz - 3 fish. 10th - Mathew Atkinson (Jnr) - 5 lb 14 oz - 3 fish. 11th - Jimmy Middlemas - 5 lb 06 oz - 4 fish. 12th - Mike Gilpin - 4 lb 00 oz - 3 fish. 13th - Dave Perrett - 3 lb 11 oz - 3 fish. 14th - Phil Mead - 3 lb 03 oz - 3 fish. 15th - Mike Kilpatrick - 3 lb 00 oz - 3 fish. 16th - Andrew Craig - 2 lb 13 oz - 2 fish. 17th - James Gilpin - 2 lb 05 oz - 2 fish. 18th - Paul Kilpatrick - 1 lb 04 oz - 1 fish. 19th - Glen Kilpatrick - 1 lb 03 oz - 1 fish. 20th - Chris Evans - 0 lb 13 oz - 1 fish. 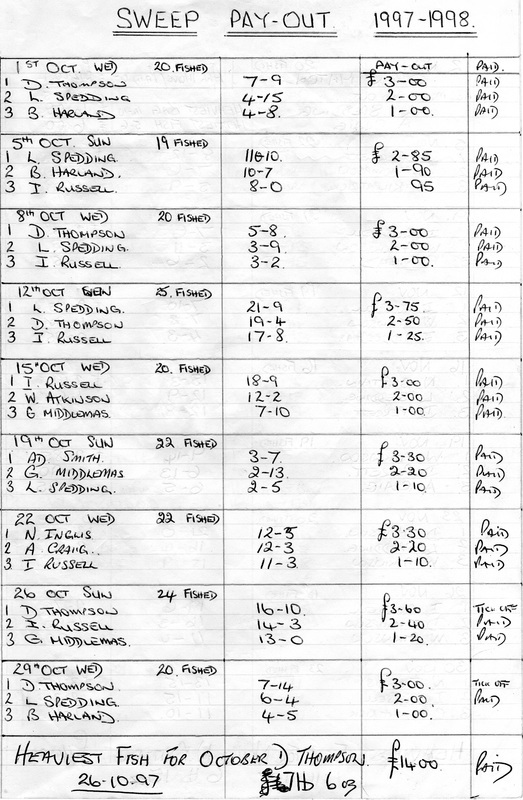 Wed 29 Oct 1997 - Match 9. 42 fish for 53 lb 9/16oz. There was a slight south easterly swell which created movement close into shore as anglers fished a high tide ebb contest on a fine evening. In this match the second leg of the singles knockout competition was fished in which 40 fish were weighed in with the heaviest fish of the night 5 lb 02 oz falling to junior club angler Mathew Atkinson (Jnr). John Butler beat Norman Brittain (1 lb 02 oz - 0 lb 00 oz). 1st - Dave Perrett - 8 lb 12 oz - 7 fish. 2nd - Denis Thompson - 7 lb 06 oz - 4 fish. 3rd - Mike Kilpatrick - 5 lb 09 oz - 4 fish. 4th - Mathew Atkinson (Jnr) - 5 lb 02 oz - 1 fish. 5th - Bernard Vasey - 4 lb 15 oz - 4 fish. 6th - Ian Russell - 4 lb 12 oz - 2 fish. 7th - Paul Kilpatrick - 4 lb 06 oz - 4 fish. 8th - Mike Vasey - 3 lb 12 oz - 3 fish. 9th - Philip Kilpatrick (Jnr) - 3 lb 10 oz - 3 fish. 10th = Adrian Smith - 1 lb 11 oz - 2 fish. 10th = William Atkinson - 1 lb 11 oz - 2 fish. 12th = Andrew Craig - 1 lb 02 oz - 1 fish. 12th = John Butler - 1 lb 02 oz - 1 fish. 14th - Phil Mead - 1 lb 01 oz - 1 fish. 15th - Jimmy Middlemas - 0 lb 14 oz - 1 fish. The south easterly had moved round to a south westerly and this left very little swell as the flooding tide got under way and not much colour in the water. There was a total of 30 fish weighed in for the nights catch with the heaviest fish under 3 lb, the heaviest bag winner was Ian Russell who had 5 fish for 7 lb 06 oz. 1st - Ian Russell - 7 lb 06 oz - 5 fish. 2nd - William Atkinson - 3 lb 11 oz - 3 fish. 3rd - Phil Mead - 2 lb 06 oz - 2 fish. 4th - Bernard Vasey - 2 lb 04 oz - 2 fish. 5th = Denis Thompson - 1 lb 14 oz - 2 fish. 5th = Mike Gilpin - 1 lb 14 oz - 2 fish. 7th - Adrian Nelson - 1 lb 13 oz - 2 fish. 8th - Ben Laws (Jnr) - 1 lb 11 oz - 1 fish. 9th - Andrew Craig - 1 lb 07 oz - 1 fish. 10th - Brian Harland - 1 lb 03 oz - 1 fish. 11th - Adrian Smith - 1 lb 02 oz - 1 fish. 12th = James Gilpin - 1 lb 01 oz - 1 fish. 12th = Mathew Atkinson (Jnr) - 1 lb 01 oz - 1 fish. 14th = Norman Brittain - 1 lb 00 oz - 1 fish. 14th = Adam Storr (Jnr) - 1 lb 00 oz - 1 fish. 16th - Mike Vasey - 0 lb 15 oz - 1 fish. 17th - Dave Perrett - 0 lb 14 oz - 1 fish. 18th = Graham Wright - 0 lb 07 oz - 1 fish. 18th = Stuart Crowe (Jnr) - 0 lb 07 oz - 1 fish. Once again the calm conditions were present for the nights match with a half ebbing tide 16 anglers were fishing the second round of the doubles knockout competition. A total of 32 fish were weighed in for 41 lb which still shows the bigger fish are nit showing. The fishing is much the same along the North east coast with anglers still wanting the north westerlys to stir the sea bed up and bring the larger fish closer to the shore to feed. Neil Inglis - 3 lb 01 oz and Phil Mead - 2 lb 05 oz. Paul Kilpatrick - 0 lb 00 oz and Mike Kilpatrick - 0 lb 00 oz. George Middlemas - 1 lb 12 oz and Glen Kilpatrick - 0 lb 00 oz. William Atkinson - 7 lb 02 oz and Mike Vasey - 0 lb 00 oz. 1st - Ian Russell - 7 lb 10 oz - 6 fish. 2nd - William Atkinson - 7 lb 02 oz - 5 fish. 3rd - Jimmy Middlemas - 4 lb 03 oz - 3 fish. 4th - Les Spedding - 3 lb 14 oz - 3 fish. 5th - Neil Inglis - 3 lb 01 oz - 3 fish. 6th - Norman Brittain - 2 lb 15 oz - 3 fish. 7th - Bernard Vasey - 2 lb 13 oz - 2 fish. 8th - Denis Thompson - 2 lb 06 oz - 2 fish. 9th - Phil Mead - 2 lb 05 oz - 2 fish. 10th - George Middlemas - 1 lb 12 oz - 1 fish. 11th = Mathew Atkinson (Jnr) - 1 lb 10 oz - 1 fish. 11th = Chris Evans (Jnr) - 1 lb 10 oz - 1 fish. Although a very wet and windy night produced a few better fish as the wind had gone round to a southerly and provided movement to some of the south facing marks. The heaviest fish of the month competition for November was landed tonight by Norman Brittain 6 lb 15 oz, he also won the nights event with the heaviest bag of 15 lb 03 oz, 4 fish. 1st - Norman Brittain - 15 lb 03 oz - 4 fish. 2nd - Les Spedding - 12 lb 09 oz - 9 fish. 3rd - Dave Perrett - 12 lb 08 oz - 4 fish. 4th - Denis Thompson - 11 lb 05 oz - 9 fish. 5th - George Middlemas - 6 lb 05 oz - 3 fish. 6th - Phil Mead - 5 lb 04 oz - 3 fish. 7th - William Atkinson - 4 lb 03 oz - 3 fish. 8th - Paul Kilpatrick - 2 lb 00 oz - 2 fish. 9th - Mathew Atkinson (Jnr) - 1 lb 10 oz - 1 fish. 10th - Bernard Vasey - 1 lb 07 oz - 1 fish. 11th - Arthur Storr - 1 lb 05 oz - 1 fish. 12th - Neil Inglis - 1 lb 03 oz - 1 fish. 13th - Chris Evans (Jnr) - 1 lb 01 oz - 1 fish. 14th - Jeff Stafford - 1 lb 00 oz - 1 fish. 15th - Ben Laws (Jnr) - 0 lb 15 oz - 1 fish. 16th - Philip Kilpatrick (Jnr) - 0 lb 12 oz - 1 fish. Bridlington Open invitation match 29th and 30th November. The Cloughton Open 7th December. There was a total of 35 fish weighed in from a southerly swell for the Whitby Sea Anglers Association club match. The catch could have been bigger but strong wind and heavy rain showers spoiled the night along with loose weed fouling anglers lines. William Atkinson won the nights event. 1st - William Atkinson - 9 lb 14 oz - 4 fish. 2nd - Dave Perrett - 6 lb 13 oz - 6 fish. 3rd - Andrew Craig - 6 lb 05 oz - 5 fish. 4th - Neil Inglis - 6 lb 00 oz - 2 fish. 5th - Phil Mead - 5 lb 08 oz - 4 fish. 6th - Mathew Atkinson (Jnr) - 4 lb 05 oz - 3 fish. 7th - Norman Brittain - 4 lb 04 oz - 2 fish. 8th - Mike Kilpatrick - 4 lb 01 oz - 3 fish. 9th - Les Spedding - 3 lb 11 oz - 3 fish. 10th - Paul Kilpatrick - 2 lb 07 oz - 2 fish. 11th - Brian Harland - 1 lb 01 oz - 1 fish. There was still plenty of swell running as the tide flooded in for the nights match with 4 anglers weighing in double figure bags of fish. This took 3 anglers over 100 lb barrier for their total weight of fish for the season to date. Denis Thompson - 115 lb 13 oz - 70 fish. Les Spedding - 112 lb 15 oz - 69 fish. Ian Russell - 107 lb 08 oz - 69 fish. It was yet another wet and showery night but the sea conditions were better as 77 fish were returned to the scales for a total weigh in of 127 lb 11 oz. 1st - Denis Thompson - 21 lb 00 oz - 10 fish. 2nd - Les Spedding - 16 lb 04 oz - 6 fish. 3rd - William Atkinson - 15 lb 09 oz - 7 fish. 4th - Ian Russell - 10 lb 15 oz - 6 fish. 5th - Dave Batchelor - 9 lb 07 oz - 6 fish. 6th - Andrew Craig - 8 lb 03 oz - 6 fish. 7th - Mike Vasey - 7 lb 09 oz - 5 fish. 8th - Paul Kilpatrick - 6 lb 10 oz - 4 fish. 9th - Neil Inglis - 6 lb 06 oz - 5 fish. 10th - Brian Harland - 5 lb 02 oz - 4 fish. 11th - Adam Storr (Jnr) - 3 lb 13 oz - 3 fish. 12th - Glen Kilpatrick - 3 lb 07 oz - 3 fish. 13th = Bernard Vasey - 2 lb 14 oz - 2 fish. 13th = Philip Kilpatrick (Jnr) - 2 lb 14 oz - 3 fish. 15th - Dave Perrett - 2 lb 08 oz - 3 fish. 16th - Arthur Storr - 1 lb 10 oz - 1 fish. 17th - Chris Evans (Jnr) - 1 lb 05 oz - 1 fish. 18th - Adrian Smith - 1 lb 02 oz - 1 fish. 19th - Norman Brittain - 1 lb 01 oz - 1 fish. The singles knockout tournament competition went into the third round for the Whitby Sea Anglers Association club members. It was an ebbing tide low water, into flooding tide match as a south easterly swell gave movement close to shore. There was a good nights result as a total of 89 fish were returned to the scales. Ian Russell - 19 lb 06 oz beat Andrew Craig - 4 lb 08 oz. 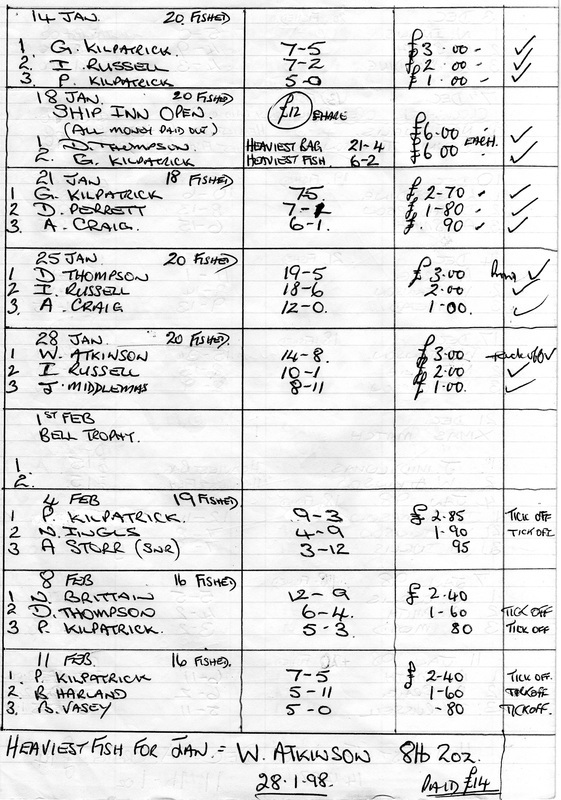 Denis Thompson - 16 lb 05 oz beat Mike Kilpatrick 0 lb 00 oz. Phil Mead - 8 lb 08 oz beat Dave Perrett - 0 lb 15 oz. John Butler - 4 lb 11 oz beat Mathew Atkinson (Jnr) - 2 lb 11 oz. 1st - Ian Russell - 19 lb 06 oz - 10 fish. 2nd - Denis Thompson - 16 lb 05 oz - 9 fish. 3rd - William Atkinson - 11 lb 04 oz - 4 fish. 4th - Neil Inglis - 10 lb 10 oz - 7 fish. 5th - Phil Mead - 8 lb 08 oz - 5 fish. 6th - Adrian Smith - 7 lb 13 oz - 6 fish. 7th - Bernard Vasey - 7 lb 07 oz - 5 fish. 8th - Paul Kilpatrick - 6 lb 13 oz - 5 fish. 9th - Dave Batchelor - 6 lb 01 oz - 3 fish. 10th = Glen Kilpatrick - 5 lb 13 oz - 5 fish. 10th = Mike Vasey - 5 lb 13 oz - 5 fish. 12th - Dave Batchelor - 4 lb 11 oz - 4 fish. 13th - Andrew Craig - 4 lb 08 oz - 4 fish. 14th - Chris Evans (Jnr) - 3 lb 10 oz - 3 fish. 15th - Philip Kilpatrick (Jnr) - 3 lb 07 oz - 3 fish. 16th - Les Spedding - 3 lb 02 oz - 2 fish. 17th - Mathew Atkinson (Jnr) - 2 lb 11 oz - 2 fish. 18th - Norman Brittain - 2 lb 10 oz - 2 fish. 19th - Brian Harland - 1 lb 08 oz - 1 fish. 20th = Dave Perrett - 0 lb 15 oz - 1 fish. 20th = Ben Laws (Jnr) - 0 lb 15 oz - 1 fish. Sundays 4 hour match started 2 hours after high water and the sea swell was still present but had moved round to a northerly motion and yet another wet showery-hail night, but again anglers returned with good results as a few better fish were weighed in, up to 5 lb. Results, a total of 109 fish for 161 lb 09 oz. 1st - Neil Inglis - 13 lb 15 oz - 7 fish (his best this season). 2nd - Ian Russell - 11 lb 15 oz - 9 fish. 3rd - Paul Kilpatrick - 11 lb 10 oz - 7 fish (also his best this season). 4th - Les Spedding - 10 lb 05 oz - 8 fish. 5th - Andrew Craig - 9 lb 13 oz - 6 fish. 6th - Glen Kilpatrick - 9 lb 04 oz - 4 fish. 7th - Denis Thompson - 8 lb 13 oz - 6 fish. 8th - Mike Gilpin - 8 lb 10 oz - 7 fish. 9th - Phil Mead - 8 lb 02 oz - 6 fish. 10th - Bernard Vasey - 7 lb 14 oz - 4 fish. 11th - Dave Perrett - 7 lb 14 oz - 6 fish. 12th = Mathew Atkinson (Jnr) - 6 lb 14 oz - 3 fish, one of 4 lb 04 oz. 12th = Mike Kilpatrick - 6 lb 14 oz - 3 fish. 14th - Mike Vasey - 6 lb 02 oz - 5 fish. 15th - Dave Batchelor - 5 lb 10 oz - 5 fish. 16th = James Gilpin - 4 lb 04 oz - 3 fish. 16th = George Middlemas - 4 lb 04 oz - 4 fish. 18th - Norman Brittain - 3 lb 14 oz - 3 fish. 19th - William Atkinson - 3 lb 13 oz - 3 fish. 20th - Brian Harland - 2 lb 07 oz - 2 fish. 21st - Adrian Smith - 1 lb 15 oz - 2 fish. 22nd - Stuart Wink (Jnr) - 1 lb 13 oz - 2 fish. 23rd - Philip Kilpatrick (Jnr) - 1 lb 09 oz - 1 fish. 24th - Graham Wright - 1 lb 06 oz - 1 fish. 25th - Adrian Nelson - 1 lb 05 oz - 1 fish. 26th - Adam Storr (Jnr) - 1 lb 04 oz - 1 fish. 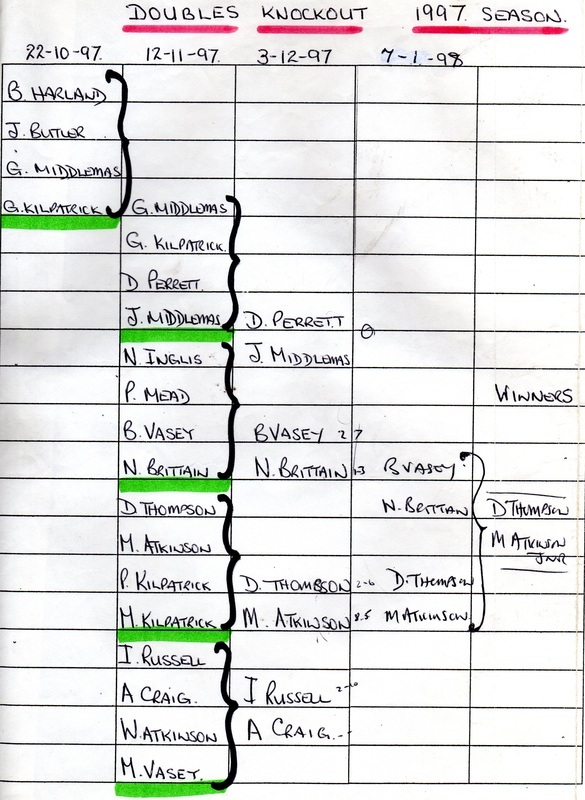 7th December Cloughton Open - members note no night match as this is a club match. 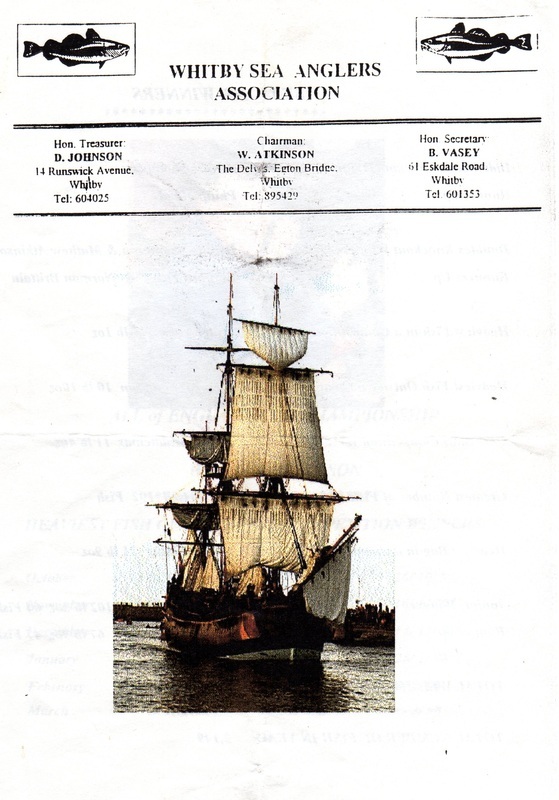 18th January 1998 Ship Inn Open. The mid week match incorporated the semi final of the doubles knockout competition for Whitby Sea Anglers Association members. It gave an excellent result for Mathew Atkinson (Jnr) when he returned with 3 fish for 8 lb 05 oz, one codling of 6 lb 01 oz. Ian Russell - 2 lb 10 oz and Andrew Craig - 0 lb 00 oz. Dave Perrett - 0 lb 00 oz and Jimmy Middlemas - 0 lb 00 oz. 1st - Mathew Atkinson (Jnr) - 8 lb 05 oz - 3 fish, one of 6 lb 01 oz. 2nd - Neil Inglis - 5 lb 00 oz - 2 fish. 3rd - Adrian Smith - 4 lb 09 oz - 3 fish. 4th - Les Spedding - 4 lb 03 oz - 3 fish. 5th - Mike Vasey - 3 lb 07 oz - 3 fish. 7th - Bernard Vasey - 2 lb 07 oz - 2 fish. 9th - Dave Batchelor - 2 lb 01 oz - 2 fish. 10th - William Atkinson - 2 lb 00 oz - 2 fish. 11th - John Butler - 1 lb 14 oz - 2 fish. 12th = Arthur Storr - 1 lb 11 oz - 1 fish. 12th = Brian Harland - 1 lb 11 oz - 1 fish. 14th - Glen Kilpatrick - 1 lb 04 oz - 1 fish. 15th - Norman Brittain - 1 lb 03 oz - 1 fish. 16th - Phil Mead - 1 lb 03 oz - 1 fish. 17th - Paul Kilpatrick - 1 lb 02 oz - 1 fish. 4 lb 11 oz - 2 fish. 2 lb 11 oz - 2 fish. 2 lb 07 oz - 2 fish. ​Sunday’s match was a day match competition fishing the Cloughton Open from 11am to 5pm with the weigh in at the Red Lion in Cloughton. This was a Heaviest Fish competition and after a very windy showery day the eventful winner was J Johnson of Scarborough with the wining cod of 6 lb 07 oz. 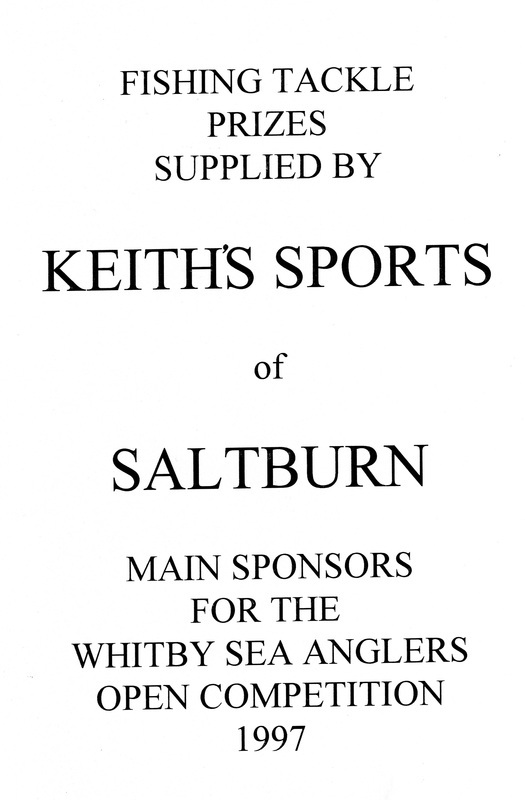 Members of Whitby Sea Anglers Association were in the following places. 4th - Neil Inglis - 5 lb 11 oz, he also had another fish of 3 lb 10 oz. 10th - Denis Thompson 4 lb 11 oz. 14th - Adrian Smith - 3 lb 07 oz. 1st - Neil Inglis - 11 lb 06 oz - 4 fish. 2nd - Denis Thompson - 5 lb 09 oz - 2 fish. 3rd - Adrian Smith - 4 lb 11 oz - 2 fish. 4th - Andrew Craig - 3 lb 00 oz - 2 fish. 5th - Bernard Vasey - 2 lb 11 oz - 2 fish. 6th - Paul Kilpatrick - 2 lb 07 oz - 2 fish. 7th - Ian Russell - 2 lb 02 oz - 2 fish. 8th - Glen Kilpatrick - 1 lb 07 oz - 1 fish. 9th - Mathew Atkinson (Jnr) - 0 lb 14 oz - 1 fish. 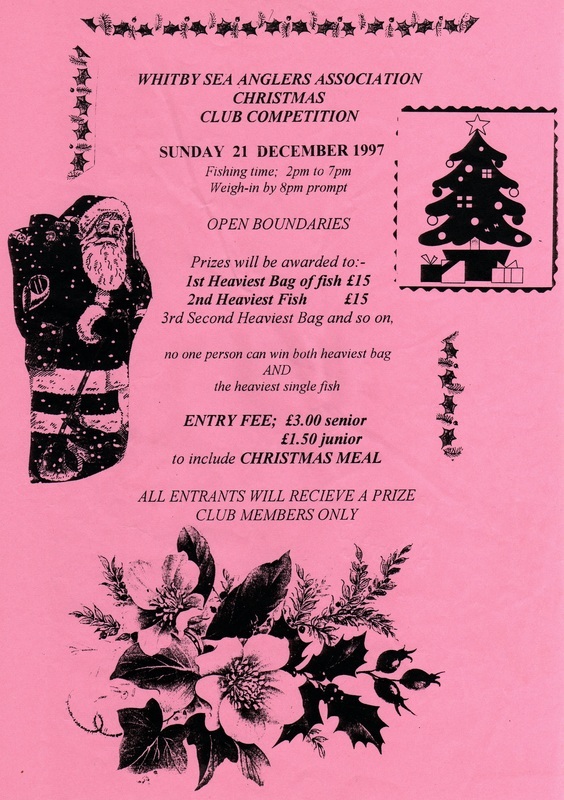 The Ship Inn Open 18th January 1998 - £300 Senior first prize and a junior section of a Beach Rod. The annual Mickleby Open has been cancelled. The small codling continued to be caught as Whitby Sea Anglers Association members fished a low water flooding tide from a northerly long distance sea swell. 1st - Les Spedding - 10 lb 06 oz - 7 fish. 2nd - Denis Thompson - 8 lb 13 oz - 5 fish. 3rd = Adrian Smith - 6 lb 15 oz - 5 fish. 3rd = Mathew Atkinson (Jnr) - 6 lb 15 oz - 5 fish. 5th - William Atkinson - 6 lb 03 oz - 3 fish. 6th - Phil Mead - 5 lb 09 oz - 4 fish. 7th - Dave Batchelor - 5 lb 05 oz - 3 fish. 8th - Brian Harland - 4 lb 02 oz - 3 fish. 9th = Dave Perrett - 3 lb 07 oz - 3 fish. 9th = Ian Russell - 3 lb 07 oz - 3 fish. 11th - Graham Wright - 3 lb 05 oz - 2 fish. 12th = Arthur Storr - 3 lb 02 oz - 2 fish. 12th = Paul Kilpatrick - 3 lb 02 oz - 2 fish. 14th - Andrew Craig - 2 lb 13 oz - 2 fish. 15th - Philip Kilpatrick (Jnr) - 2 lb 05 oz - 1 fish. 16th - Bernard Vasey - 1 lb 05 oz - 1 fish. 17th - Mike Vasey - 1 lb 02 oz - 1 fish. 18th - John Butler - 0 lb 15 oz - 1 fish. There was an easterly swell for anglers as they started to fish 2 hours after high water. 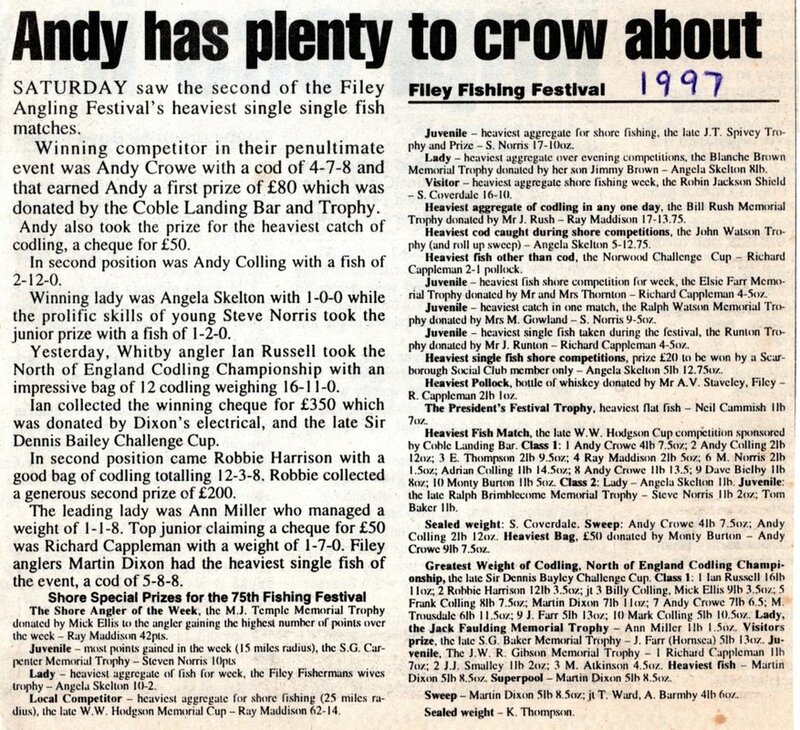 With a 5.7 metre tide and a full moon the heaviest fish of the 1997 - 1998 season was landed by Andy Craig, an 11 lb cod. This single fish also won him the nights competition. There was also some better fish weighed in by Adrian Nelson 8 lb 04 oz and Phil Mead a cod of 7 lb 00 oz. 1st - Andrew Craig - 11 lb 00 oz - 1 fish. 2nd - William Atkinson - 9 lb 14 oz - 3 fish. 3rd - Phil Mead - 9 lb 13 oz - 3 fish. 4th - Mike Vasey - 9 lb 07 oz - 5 fish. 5th - Adrian Nelson - 8 lb 04 oz - 1 fish. 6th - Dave Perrett - 8 lb 00 oz - 4 fish. 7th = Denis Thompson - 4 lb 03 oz - 3 fish. 7th = Ian Russell - 4 lb 03 oz - 3 fish. 9th - Glen Kilpatrick - 3 lb 09 oz - 2 fish. 10th - Paul Kilpatrick - 3 lb 03 oz - 3 fish. 11th - Dave Batchelor - 2 lb 14 oz - 2 fish. 12th - Neil Inglis - 2 lb 08 oz - 3 fish. 13th - Les Spedding - 2 lb 05 oz - 2 fish. 14th = Brian Harland - 1 lb 06 oz - 1 fish. 14th = Jeff Stafford - 1 lb 06 oz - 1 fish. 16th - Bernard Vasey - 1 lb 04 oz - 1 fish. 17th - Mathew Atkinson (Jnr) - 0 lb 15 oz - 1 fish. Redcar Open 28th December 1997 and Ship Inn Open 18th January 1998. A wintery night of snow flurries and a very windy cold easterly wind prevailed as anglers fished the 3 hour evening match. The sea state was also very rough and many places were not fishable although there was a good weigh in as 52 fish were returned for a total of 85 lb 09 oz. There was also a good results for senior member Graham Wright as he landed his personal best fish a cod of 6 lb 04 oz, this was the heaviest fish of the night with 2 others over 4 lb by William Atkinson and Neil Inglis. 1st - William Atkinson - 15 lb 03 oz - 8 fish. 2nd - Neil Inglis - 8 lb 13 oz - 4 fish. 3rd - Denis Thompson - 8 lb 09 oz - 6 fish. 4th - Graham Wright - 8 lb 00 oz - 2 fish. 5th - Dave Batchelor - 7 lb 11 oz - 4 fish. 6th - Philip Kilpatrick (Jnr) - 6 lb 07 oz - 4 fish. 7th - Les Spedding - 4 lb 07 oz - 4 fish. 8th - Paul Kilpatrick - 4 lb 03 oz - 3 fish. 9th - Phil Mead - 3 lb 11 oz - 3 fish. 10th - Bernard Vasey - 3 lb 08 oz - 3 fish. 11th - Ian Russell - 2 lb 13 oz - 2 fish. 12th - Andrew Craig - 2 lb 08 oz - 2 fish. 13th - Glen Kilpatrick - 2 lb 06 oz - 1 fish. 14th - Dave Perrett - 1 lb 12 oz - 2 fish. 15th - John Butler - 1 lb 10 oz - 1 fish. 16th - Perry Franklin (Jnr) - 1 lb 08 oz - 1 fish. 17th - Norman Brittain - 1 lb 08 oz - 1 fish. 18th - Adrian Smith - 1 lb 00 oz - 1 fish. This was the Christmas Match for members only, fishing a south easterly slight swell from 2pm to 7pm with an excellent turn out of anglers (34) on a dry day, 18 weighed in. The winners are the anglers with the heaviest bag and the heaviest single fish equal first. Taking the Christmas Cup Jimmy Middlemas with 5 fish for 11 lb 04 oz, the heaviest single fish of 4 lb 03 oz fell to Club Chairman William Atkinson (he also had 2 fish for 6 lb 09 oz). 1st - Jimmy Middlemas - 11 lb 04 oz - 5 fish. 2nd - Les Spedding - 7 lb 10 oz - 4 fish. 3rd - William Atkinson - 6 lb 09 oz - 2 fish. 4th - Brian Harland - 6 lb 05 oz - 4 fish. 5th - Dave Batchelor - 5 lb 12 oz - 4 fish. 6th - Andrew Craig - 4 lb 09 oz - 4 fish. 8th - Neil Inglis - 2 lb 12 oz - 2 fish. 9th - Dave Perrett - 2 lb 08 oz - 2 fish. 10th - Denis Thompson - 2 lb 07 oz - 2 fish. 11th - Ian Russell - 2 lb 02 oz - 2 fish. 12th - Adrian Nelson - 2 lb 00 oz - 2 fish. 13th - James Gilpin - 1 lb 15 oz - 2 fish. 14th - Mike Gilpin - 1 lb 14 oz - 1 fish. 15th - Adrian Smith - 1 lb 07 oz - 1 fish. 16th - Glen Kilpatrick - 1 lb 06 oz - 1 fish. 17th - Mathew Atkinson (Jnr) - 1 lb 03 oz - 1 fish. The stormy weather that had hit the south coast had not reached the north east for the start of the Whitby Sea Anglers Association evening competition. The conditions were quite good when the match had started, but wind and heavy rain returned to hamper the latter part of fishing. Denis Thompson’s season for 1998 got off to a good start as he weighed in 8 fish foe 12 lb 14 oz to win the session. Denis had also landed a fish of 10 lb 10 oz outside a club match on Boxing Day during the Scarborough Rock Anglers competition, this won him the heaviest fish prize. 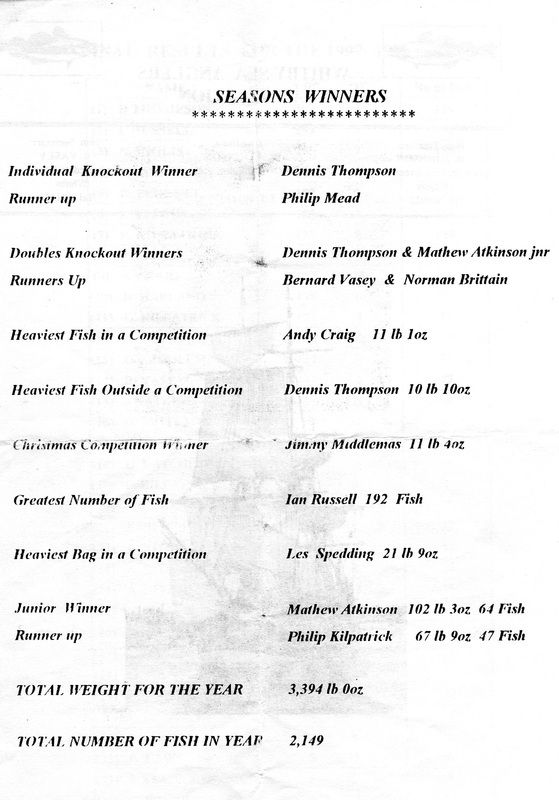 There was a tie for 2nd as Neil Inglis and William Atkinson both weighed in 7 lb 08 oz. William Atkinson started the heaviest fish for January competition with a cod of 6 lb 13 oz. 1st - Denis Thompson - 12 lb 14 oz - 8 fish. 2nd = William Atkinson - 7 lb 08 oz - 2 fish. 2nd = Neil Inglis - 7 lb 08 oz - 6 fish. 4th - George Middlemas - 6 lb 04 oz - 2 fish. 5th - Dave Batchelor - 5 lb 15 oz - 4 fish. 6th - Dave Perrett - 4 lb 14 oz - 4 fish. 7th - Glen Kilpatrick - 4 lb 10 oz - 3 fish. 8th - Andrew Craig - 3 lb 09 oz - 1 fish. 9th = Norman Brittain - 1 lb 02 oz - 1 fish. 9th = Graham Wright - 1 lb 02 oz - 1 fish. 11th = Ian Russell - 1 lb 00 oz - 1 fish. 11th = Paul Kilpatrick - 1 lb 00 oz - 1 fish. Also fished but not entered into the match was Jeff Stafford - 2 lb 13 oz - 2 fish. On a rain free evening, a south westerly strong wind kept the sea calm with very little motion to make the fish move around in search of food. On a flooding tide catches were all of small codling with 23 fish for a total weight of 27 lb 07 oz. Neil Inglis won the session catching all of his four fish in the last ½ hour. 1st - Neil Inglis - 5 lb 05 oz - 4 fish. 2nd - Adrian Smith - 4 lb 02 oz - 3 fish. 3rd - Phil Mead - 3 lb 02 oz - 2 fish. 4th - George Middlemas - 2 lb 08 oz - 2 fish. 5th - Denis Thompson - 2 lb 07 oz - 2 fish. 6th - Mike Vasey - 2 lb 02 oz - 2 fish. 7th - Arthur Storr - 2 lb 00 oz - 2 fish. 8th - Mathew Atkinson (Jnr) - 1 lb 15 oz - 2 fish. 9th - John Butler - 1 lb 08 oz - 1 fish. 10th - Andrew Craig - 1 lb 04 oz - 1 fish. 12th - Ian Russell - 0 lb 15 oz - 1 fish. 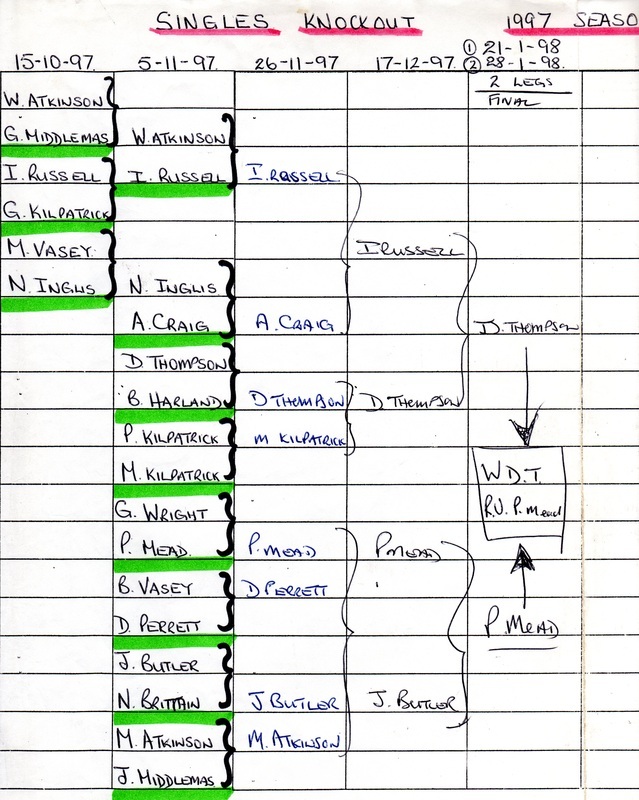 In this match Denis Thompson and Mathew Atkinson (Jnr) won the 1997/1998 Doubles Final beating Bernard Vasey and Norman Brittain. There was more movement as anglers were fishing a half ebbing tide, they were able to fish low water marks. Once again the small codling were present as only 1 fish of 4 lb 04 oz was the heaviest fish, which was one of two which won the session for Adrian Smith with a total of 6 lb 11 oz - 2 fish. 1st - Adrian Smith - 6 lb 11 oz - 2 fish. 2nd - Andrew Craig - 6 lb 02 oz - 3 fish with one over 3 lb. 3rd - Ian Russell - 5 lb 11 oz - 4 fish. 4th - Denis Thompson - 5 lb 10 oz - 4 fish. 5th - Les Spedding - 4 lb 04 oz - 2 fish. 6th - Paul Kilpatrick - 4 lb 00 oz - 3 fish. 7th - Dave Perrett - 3 lb 05 oz - 2 fish. 8th - George Middlemas - 2 lb 12 oz - 2 fish. 9th - Neil Inglis - 2 lb 00 oz - 1 fish. 10th - Bernard Vasey - 1 lb 13 oz - 1 fish. 11th - Phil Mead - 1 lb 04 oz - 1 fish. 12th - Mike Vasey - 0 lb 15 oz - 1 fish. 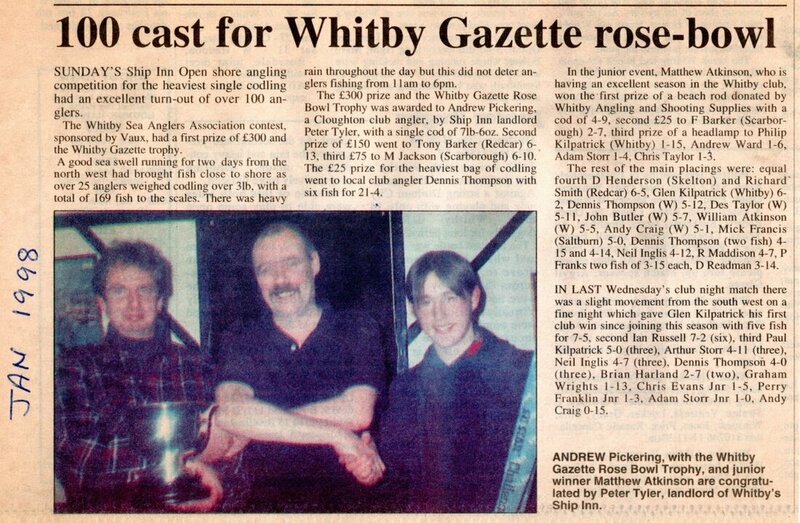 The annual Ship Inn Open this Sunday 18th January 1998 with £300 first prize for the heaviest cod and the Whitby Gazette Bowl Trophy to the winner. Also a Junior Section. In Whitby Sea Anglers Association club evening match there was a slight movement from the south west on a fine night which gave Glen Kilpatrick his first club win since joining this season, with 5 fish for 7 lb 05 oz. 1st - Glen Kilpatrick - 7 lb 05 oz - 5 fish. 2nd - Ian Russell - 7 lb 02 oz - 6 fish. 3rd - Paul Kilpatrick - 5 lb 00 oz - 3 fish. 4th - Arthur Storr - 4 lb 11 oz - 3 fish. 5th - Neil Inglis - 4 lb 07 oz - 3 fish. 6th - Denis Thompson - 4 lb 00 oz - 3 fish. 7th - Brian Harland - 2 lb 07 oz - 2 fish. 8th - Graham Wright - 1 lb 13 oz - 1 fish. 9th - Chris Evans (Jnr) - 1 lb 05 oz - 1 fish. 10th - Perry Franklin (Jnr) - 1 lb 03 oz - 1 fish. 11th - Adam Storr (Jnr) - 1 lb 00 oz - 1 fish. 12th - Andrew Craig - 0 lb 15 oz - 1 fish. 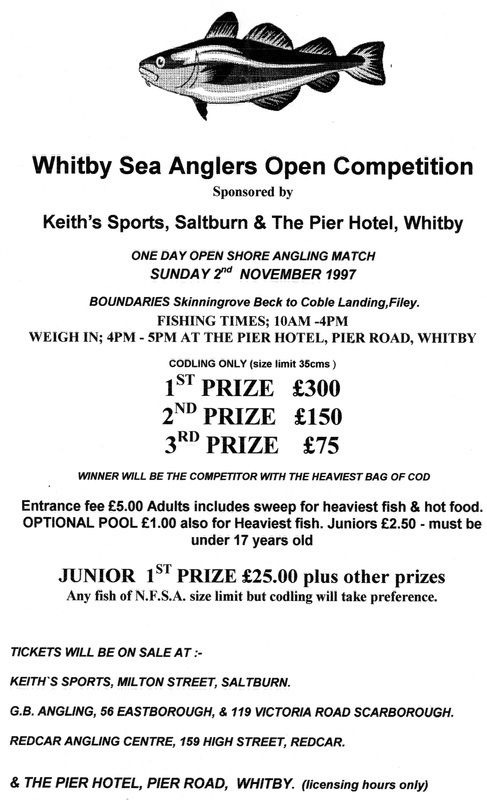 ​Ship Inn Open, this is a Whitby Sea Anglers Association supported match and all members weights count towards their season totals..
Sunday’s Ship Inn Open Shore Angling Competition which is sponsored by Vaux for the heaviest single fish (codling) had an excellent turn out of over 100 anglers. There was a good sea swell which had been running for a couple of days from the north west, this had brought fish close to shore as over 25 anglers weighed in codling over 3 lb, with a total of 169 fish to the scales. There was heavy rain through-out the day but this did not deter anglers fishing from 11am to 6pm. 1st prize of £300 and the Whitby Gazette Bowl Trophy was awarded to Andrew Pickering, a Cloughton angler, by the Ship Inn landlord Peter Tyler with a single cod of 7 lb 06 oz. 2nd prize of £150 to Tony Barker from Redcar 6 lb 13 oz. 3rd prize of £75 to M Jackson of Scarborough 6 lb 10 oz. The £25 prize for the heaviest bag went to local angler Denis Thompson - 21 lb 04 oz - 6 fish. The Junior event had a result this year. 1st - Mathew Atkinson (Whitby Jnr) (who is having an excellent season in the Whitby Club) won the first place prize of a beach rod donated by Whitby Angling & Shooting Supplies with a cod of 4 lb 09 oz. 4th - Andrew Ward 1 lb 06 oz. 5th - Adam Storr (Whitby Jnr) 1 lb 06 oz. 6th - Chris Taylor 1 lb 03 oz. 1st - Andrew Pickering - Cloughton - 7 lb 06 oz. 2nd - Tony Barker - Redcar - 6 lb 13 oz. 4th = D Henderson - Skelton - 6 lb 05 oz. 4th = Richard Smith - Redcar - 6 lb 05 oz. 6th - Glen Kilpatrick - Whitby - 6 lb 02 oz. 7th - Denis Thompson - Lythe - 5 lb 12 oz. 8th - Des Taylor - Kettleness - 5 lb 11 oz. 9th - John Butler - Whitby - 5 lb 07 oz. 10th - William Atkinson - Egton - 5 lb 05 oz. 11th - Andrew Craig - Whitby - 5 lb 01 oz. 12th - Mick Francis - Saltburn - 5 lb 00 0z. 13th - Denis Thompson - Lythe - 4 lb 15 oz. 14th - Denis Thompson - Lythe - 4 lb 14 oz. 15th - Neil Inglis - Whitby - 4 lb 12 oz. 16th - Ray Maddison - 4 lb 07 oz. 17th - P Franks - 3 lb 15 oz. 18th - P Franks - 3 lb 15 oz. 19th - D Readman - 3 lb 14 oz. 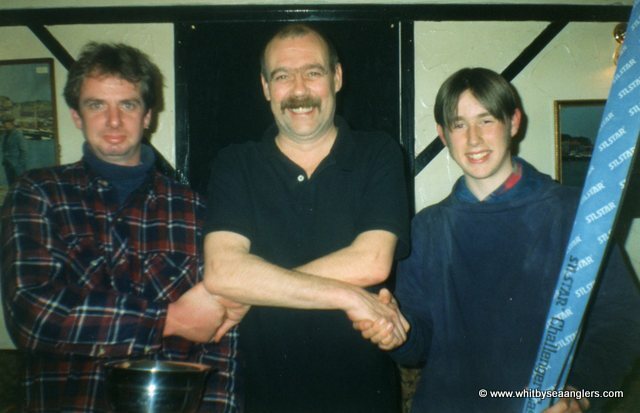 18th January 1998 - Ship Inn Open winner Andrew Pickering 7 lb 06 oz, Pete Tyler (landlord) and Junior Section Winner Matthew Atkinson (WSAA Jnr). Photograph by Bernard Vasey. ​Club Results. 155 lb 02 oz Total clubs weigh in. 1st - D Thompson - 21 lb 4/16oz - 6 fish. 2nd - N Inglis - 18 lb 6/16oz - 8 fish. 3rd - W Atkinson - 15 lb 10/16oz - 8 fish. 4th - Adrian Smith - 10 lb 5/16oz - 6 fish. 5th - Mathew Atkinson (Jnr) - 9 lb 12/16oz - 5 fish. 6th - G Kilpatrick - 9 lb 11/16oz - 2 fish. 7th - P Mead - 8 lb 1/16oz - 4 fish. 8th - D Batchelor - 8 lb 00 oz - 4 fish. 9th - A Craig - 6 lb 15/16oz - 2 fish. 10th - D Perrett - 6 lb 5/16oz - 4 fish. 11th - B Harland - 6 lb 4/16oz - 4 fish. 12th - I Russell - 6 lb 3/16oz - 4 fish. 13th - J Butler - 5 lb 7/16oz - 1 fish. 14th - L Spedding - 4 lb 11/16oz - 2 fish. 15th - G Middlemas - 4 lb 1/16oz - 3 fish. 16th - N Brittain - 3 lb 8/16oz - 2 fish. 17th - P Kilpatrick - 3 lb 00 oz - 2 fish. 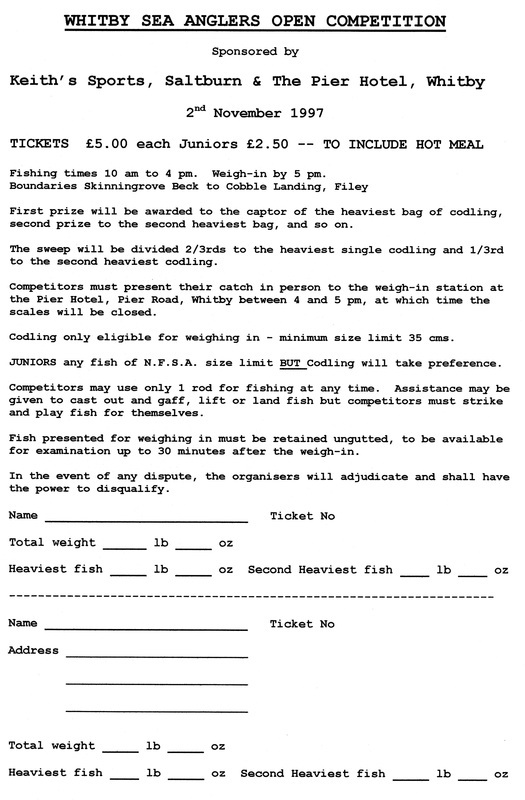 18th - B Laws (Jnr) - 2 lb 14/16oz - 2 fish. 19th - P Kilpatrick (Jnr) - 2 lb 7/16oz - 2 fish. 20th - B Vasey - 2 lb 6/16oz - 1 fish. In Whitby Sea Anglers Association evening match Glen Kilpatrick won his 2nd match this season with 7 lb 05 oz - 4 fish. The tide was flooding with very little movement on a fine night. 1st - Glen Kilpatrick - 7 lb 05 oz - 4 fish. 2nd - Dave Perrett - 7 lb 01 oz - 4 fish. 3rd - Andrew Craig - 6 lb 01 oz - 4 fish. 4th - Les Spedding - 5 lb 07 oz - 3 fish. 5th - Paul Kilpatrick - 4 lb 06 oz - 3 fish. 6th - Phil Mead - 3 lb 03 oz - 2 fish. 7th - Neil Inglis - 3 lb 00 oz - 2 fish. 8th - John Butler - 2 lb 08 oz - 2 fish. 9th - Denis Thompson - 2 lb 06 oz - 2 fish. 10th - Ben Laws (Jnr) - 2 lb 04 oz - 2 fish. 11th - Ian Russell - 1 lb 10 oz - 1 fish. 12th - Mathew Atkinson (Jnr) - 1 lb 08 oz - 1 fish. 13th - Perry Franklin (Jnr) - 1 lb 08 oz - 1 fish. 14th - Dave Batchelor - 1 lb 03 oz - 1 fish. 15th - Philip Kilpatrick (Jnr) - 1 lb 03 oz - 1 fish. 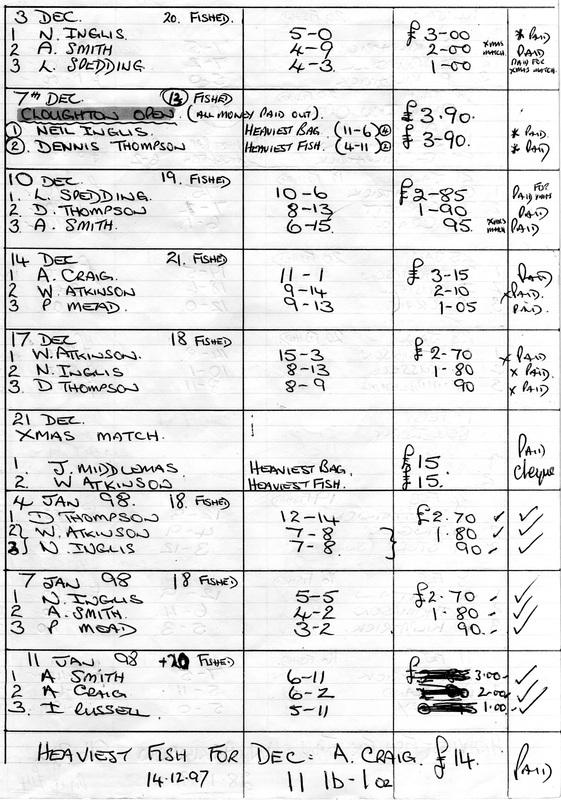 In this match the first leg of the Singles Knockout was fished with Phil Mead up against the clubs top angler Denis Thompson. Phil Mead has gone into the lead with 3 lb 03 and Denis Thompson 2 lb 06 oz. The final leg is on 28th Jan 1998. There was a good swell running from the north east which produced 67 fish to the scales, this was the best nights results for some time as the swell brought in a few bigger fish of 4 lb to 5 lb to feed on an ebbing tide. Once again Denis Thompson winning with 11 fish for 19 lb 05 oz, he is now on 242 lb 04 oz from 142 fish for this season. 1st - Denis Thompson - 19 lb 05 oz - 11 fish. 2nd - Ian Russell - 18 lb 06 oz - 9 fish. 3rd - Andrew Craig - 12 lb 00 oz - 3 fish. 4th - William Atkinson - 11 lb 09 oz - 5 fish. 5th - Brian Harland - 9 lb 02 oz - 4 fish. 6th - Adrian Smith - 9 lb 01 oz - 5 fish. 7th - Paul Kilpatrick - 8 lb 06 oz - 5 fish. 8th - Norman Brittain - 8 lb 03 oz - 2 fish. 9th - Adrian Nelson - 5 lb 04 oz - 3 fish. 10th - Mike Vasey - 4 lb 08 oz - 4 fish. 11th - Les Spedding - 4 lb 06 oz - 2 fish. 12th - Phil Mead - 4 lb 04 oz - 4 fish. 13th - Graham Wright - 2 lb 11 oz - 1 fish. 14th - Glen Kilpatrick - 2 lb 09 oz - 2 fish. 15th - James Gilpin - 1 lb 14 oz - 1 fish. 16th = Neil Inglis - 1 lb 06 oz - 1 fish. 16th = Dave Perrett - 1 lb 06 oz - 1 fish. 18th - Adam Storr (Jnr) - 1 lb 05 oz - 1 fish. 19th - George Middlemas - 1 lb 03 oz - 1 fish. 20th - Dave Batchelor - 1 lb 02 oz - 1 fish. 21st - Mathew Atkinson (Jnr) - 1 lb 00 oz - 1 fish. 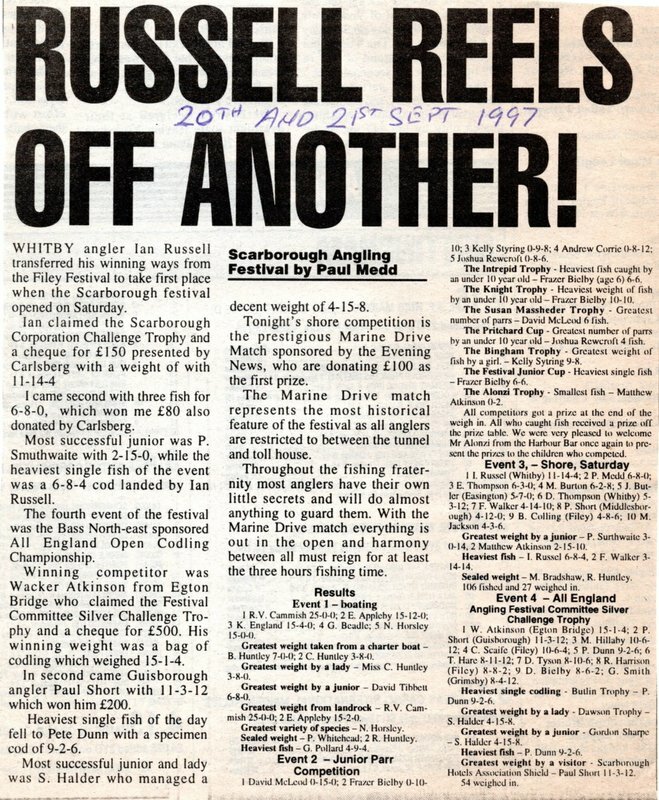 1st February 1998 the inter-club knockout tournament for the “Bell Trophy”, Whitby Sea Anglers Association will be fishing to retain the “Bell” within the Scarborough boundaries. A good sea swell resulted in the heaviest fish of the month for the January competition tipping the scales at 8 lb 02 oz, this was one of four fish for William Atkinson who also won the nights event with a 14 lb 08 oz bag. There was a total of 49 fish weighed in as anglers fished an ebbing tide on a cool fine night. 1st - William Atkinson - 14 lb 08 oz - 4 fish. 2nd - Ian Russell - 10 lb 01 oz - 6 fish. 3rd - Jimmy Middlemas - 8 lb 11 oz - 5 fish. 4th - Dave Perrett - 8 lb 04 oz - 5 fish. 5th - Adam Storr (Jnr) - 7 lb 13 oz - 4 fish. 6th - Les Spedding - 6 lb 09 oz - 4 fish. 7th - Paul Kilpatrick - 6 lb 04 oz - 4 fish. 8th - Bernard Vasey - 4 lb 00 oz - 2 fish. 9th - Denis Thompson - 3 lb 14 oz - 3 fish. 10th - Philip Kilpatrick (Jnr) - 3 lb 05 oz - 1 fish. 11th - John Butler - 3 lb 04 oz - 2 fish. 12th - Andrew Craig - 2 lb 13 oz - 1 fish. 13th - Brian Harland - 2 lb 09 oz - 2 fish. 14th - Graham Wright - 2 lb 05 oz - 2 fish. 15th - Perry Franklin (Jnr) - 1 lb 08 oz - 1 fish. 16th - Arthur Storr - 1 lb 04 oz - 1 fish. 17th - Adrian Smith - 0 lb 15 oz - 1 fish. 18th - Norman Brittain - 0 lb 14 oz - 1 fish. 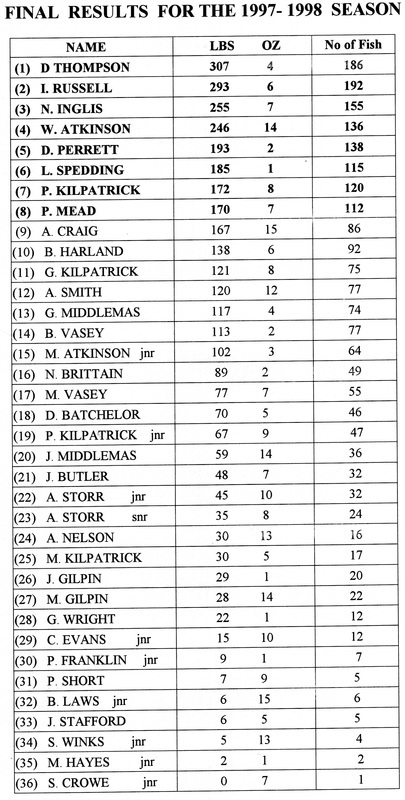 In this match Phil Mead was unlucky not to weigh in as Denis Thompson continued to find fish and win the singles knockout cup for 1997/1998 season with 6 lb to 3 lb 03 aggregate over two matches. ​This was the annual inter-club knockout tournament for the “Bell Trophy”, held in the Scarborough boundaries of Hayburn Wyke to Coble Landing Filey. 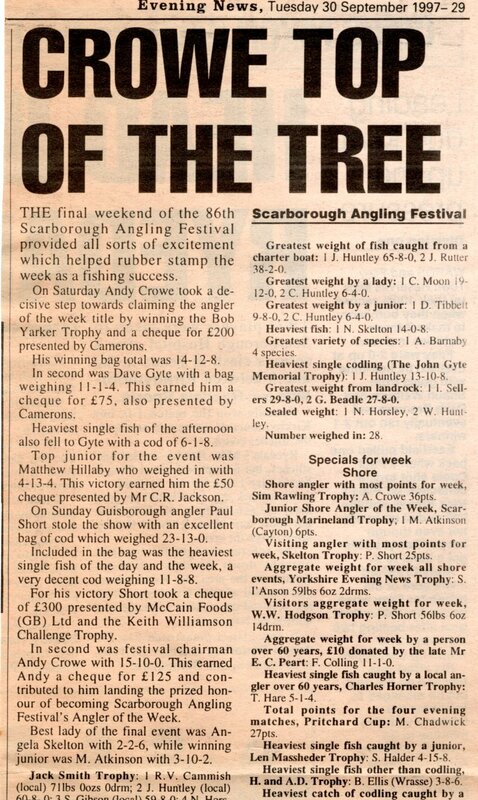 This was a four hour match competing for the Bell Trophy which Whitby Sea Anglers Association won last year. It was a dry day but very cold as anglers fished an ebbing tide with very little movement as the sea swell had become calm from a south west breeze. This years winners were Scarborough Rock Anglers with Whitby Sea Anglers Association being placed fourth out of nine of the invited teams. 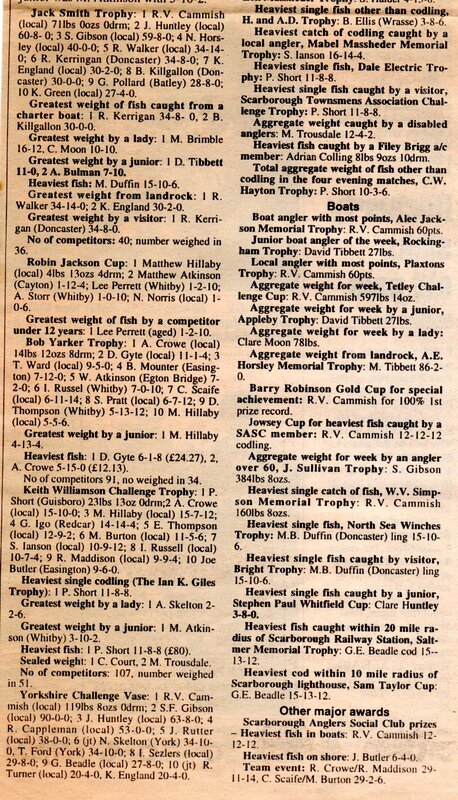 Whitby anglers who weighed in were. Neil Inglis - 1 lb 15 oz - 2 fish. Dave Perrett - 1 lb 11 oz - 1 fish. Glen Kilpatrick - 1 lb 00 oz - 1 fish. Ian Russell - 0 lb 15 oz - 1 fish. Jimmy Middlemas - 0 lb 15 oz - 1 fish. Andrew Craig - 0 lb 15 oz - 1 fish. An average of 09 oz per angler who fished for the club. The fish had become scarce for Whitby Sea Anglers Association members mid-week match as the conditions were calm on a flooding tide. There were only 17 fish weighed in, the heaviest fish 3 lb 12 oz caught by Arthur Storr. Paul Kilpatrick made a move from the soft ground of the beach to the hard ground of the scars to land 6 fish for 9 lb 03 oz and win the nights competition. 1st - Paul Kilpatrick - 9 lb 03 oz - 6 fish. 3rd - Arthur Storr - 3 lb 12 oz - 1 fish. 4th - Jimmy Middlemas - 3 lb 07 oz - 1 fish. 5th - Denis Thompson - 2 lb 12 oz - 1 fish. 6th - Les Spedding - 2 lb 02 oz - 2 fish. 7th - Phil Mead - 2 lb 01 oz - 1 fish. 8th - Philip Kilpatrick (Jnr) - 1 lb 08 oz - 1 fish. 9th - Adrian Smith - 1 lb 07 oz - 1 fish. 10th - William Atkinson - 1 lb 05 oz - 1 fish. The calm sea conditions continued with a presence of a falling strong wind, as anglers were able to go onto the scars to fish an ebbing tide and hopefully reach the fish in the tangles at low water marks. Norman Brittain found a good fish of 6 lb 04 oz and also win the nights event with 4 fish for 12 lb 09 oz . 1st - Norman Brittain - 12 lb 09 oz - 4 fish, including one of 6 lb 04 oz. 2nd - Denis Thompson - 6 lb 04 oz - 5 fish. 3rd - Paul Kilpatrick - 5 lb 03 oz - 2 fish. 4th - William Atkinson - 4 lb 07 oz - 4 fish. 5th - Mathew Atkinson (Jnr) - 3 lb 15 oz - 2 fish. 6th - James Gilpin - 3 lb 07 oz - 3 fish. 7th - Ian Russell - 3 lb 00 oz - 2 fish. 8th - Mike Vasey - 2 lb 10 oz - 1 fish. 9th - Dave Perrett - 2 lb 00 oz - 2 fish. 10th - Bernard Vasey - 1 lb 06 oz - 1 fish. 11th - Neil Inglis - 1 lb 05 oz - 1 fish. A strong westerly wind hampered casting and spoiled the nights competition as Whitby Sea Anglers Association members fished the ebbing tide. It was a warm evening and the sea state was fairly calm with a slight lift close to shore. At the end of a 3 hour match there were 17 fish weighed in, the heaviest fish a 4 lb 04 oz codling for Brian Harland. The heaviest bag went to Paul Kilpatrick, his second victory in a row. 1st - Paul Kilpatrick - 7 lb 05 oz - 4 fish. 2nd - Brian Harland - 5 lb 11 oz - 2 fish. 3rd - Bernard Vasey - 5 lb 00 oz - 3 fish. 4th - Phil Mead - 3 lb 03 oz - 2 fish. 5th - Dave Perrett - 3 lb 00 oz - 2 fish. 6th - Ian Russell - 2 lb 07 oz - 2 fish. 7th - Jimmy Middlemas - 1 lb 04 oz - 1 fish. 8th - Denis Thompson - 1 lb 03 oz - 1 fish. There was a variety of fish on the scales consisting of sand dabs, rocklings, billet and codling. The calm sea conditions remained and the mild weather for this time of year continued due to the south westerly winds. This time the soft ground gave a winning bag of fish for Dave Perrett with the ebbing tide. 1st - Dave Perrett - 9 lb 07 oz - 6 fish. 2nd - Brian Harland - 5 lb 00 oz - 3 fish. 3rd - Phil Mead - 4 lb 03 oz - 4 fish. 4th - Paul Kilpatrick - 2 lb 10 oz - 3 fish. 5th - Adrian Smith - 2 lb 03 oz - 1 fish. 6th - Ian Russell - 1 lb 13 oz - 1 fish. 7th - Arthur Storr - 1 lb 10 oz - 1 fish. 8th - Denis Thompson - 1 lb 07 oz - 1 fish. 9th - Mike Vasey - 1 lb 06 oz - 1 fish. 10th - William Atkinson - 1 lb 04 oz - 1 fish. 11th - Adam Storr (Jnr) - 1 lb 03 oz - 1 fish. 12th - Jimmy Middlemas - 0 lb 13 oz - 1 fish. 13th - Mathew Atkinson (Jnr) - 0 lb 12 oz - 1 fish. 14th - Bernard Vasey - 0 lb 10 oz - 1 fish. The calm sea conditions remained unchanged for Whitby Sea Anglers Association club members. It was a top of the tide match and although it was flat calm the fish were present as Adrian Smith won the night with his special cocktail baits with 3 fish for 4 lb 08 oz. 1st - Adrian Smith - 4 lb 08 oz - 3 fish. 2nd - Jimmy Middlemas - 4 lb 04 oz - 2 fish. 3rd - Neil Inglis - 3 lb 12 oz - 3 fish. 4th - Dave Perrett - 3 lb 11 oz - 2 fish. 5th - Denis Thompson - 3 lb 01 oz - 1 fish - the heaviest fish of the night. 6th - Bernard Vasey - 2 lb 07 oz - 2 fish. 7th - Paul Kilpatrick - 2 lb 06 oz - 2 fish. 8th - Mike Vasey - 2 lb 02 oz - 1 fish. 9th - Mathew Atkinson (Jnr) - 2 lb 02 oz - 1 fish. 10th - Brian Harland - 1 lb 13 oz - 1 fish. 11th - Adam Storr (Jnr) - 1 lb 10 oz - 1 fish. 12th - Andrew Craig - 1 lb 07 oz - 1 fish. 13th - Ian Russell - 1 lb 00 oz - 1 fish. The evenings 4 hour match produced 31 fish as again the sea was calm and anglers fished a low water flood tide. The first four anglers had caught 5 fish apiece but Ian Russell had on of 4 lb 10 oz to give him a winning bag of 9 lb 09 oz. 1st - Ian Russell - 9 lb 09 oz - 5 fish. 2nd - Adrian Smith - 7 lb 13 oz - 5 fish. 3rd - Phil Mead - 7 lb 08 oz - 5 fish. 4th - Denis Thompson - 7 lb 05 oz - 5 fish. 5th - William Atkinson - 4 lb 11 oz - 3 fish. 6th - Andrew Craig - 4 lb 03 oz - 2 fish. 7th - Paul Kilpatrick - 3 lb 02 oz - 2 fish. 8th - Mathew Atkinson (Jnr) - 2 lb 11 oz - 2 fish. 9th - Neil Inglis - 2 lb 08 oz - 2 fish. A north westerly sea swell continued to run from Monday into mid-week and this allowed Whitby Sea Anglers Association members to choose their marks as the tide ebbed out with 3 anglers returning with double figure bags and 7 fish each. 1st - William Atkinson - 16 lb 15 oz - 7 fish, including one of 5 lb 07 oz. 2nd - Glen Kilpatrick - 13 lb 14 oz - 7 fish (his 1st double figure bag this season). 3rd - Neil Inglis - 11 lb 11 oz - 7 fish. 4th - Philip Kilpatrick (Jnr) - 9 lb 10 oz - 5 fish. 5th - Phil Mead - 8 lb 12 oz - 5 fish. 6th - Denis Thompson - 8 lb 09 oz - 6 fish. 7th - Mathew Atkinson (Jnr) - 8 lb 05 oz - 5 fish. 8th - Brian Harland - 5 lb 15 oz - 3 fish. 9th - Adrian Smith - 4 lb 11 oz - 3 fish. 10th - Adam Storr (Jnr) - 4 lb 01 oz - 3 fish. 11th - Jimmy Middlemas - 3 lb 06 oz - 3 fish. 12th - Mike Vasey - 3 lb 05 oz - 2 fish. 13th - Paul Kilpatrick - 3 lb 02 oz - 2 fish. 14th - Bernard Vasey - 2 lb 11 oz - 2 fish. 15th - Ian Russell - 2 lb 00 oz - 1 fish. 16th - Paul Short - 1 lb 15 oz - 1 fish. There were expectations of some better fish showing with a north by north westerly sea swell running as Whitby Sea Anglers Association members fished the 4 hour match. Alas this was not to be as the 6.1 metre high tide started to ebb it also took the swell and the water seemed to race out. There were a lot of small fish weighed in with the heaviest fish of over 4 lb for Neil Inglis who won with 4 fish for 8 lb 10 oz. 1st - Neil Inglis - 8 lb 10 oz - 4 fish. 2nd - Dave Perrett - 7 lb 11 oz - 6 fish. 3rd - Paul Kilpatrick - 6 lb 11 oz - 5 fish. 4th - William Atkinson - 5 lb 11 oz - 5 fish. 5th - Glen Kilpatrick - 5 lb 00 oz - 3 fish. 6th - Mathew Atkinson (Jnr) - 3 lb 15 oz - 3 fish. 7th - Jimmy Middlemas - 2 lb 14 oz - 1 fish. 8th - Bernard Vasey - 2 lb 12 oz - 2 fish. 9th - Brian Harland - 2 lb 06 oz - 1 fish. 10th = George Middlemas - 2 lb 02 oz - 1 fish. 10th = Phil Mead - 2 lb 02 oz - 2 fish. 12th - Mike Vasey - 1 lb 13 oz - 1 fish. 13th - Ian Russell - 1 lb 04 oz - 1 fish. 14th - Philip Kilpatrick (Jnr) - 1 lb 03 oz - 1 fish. 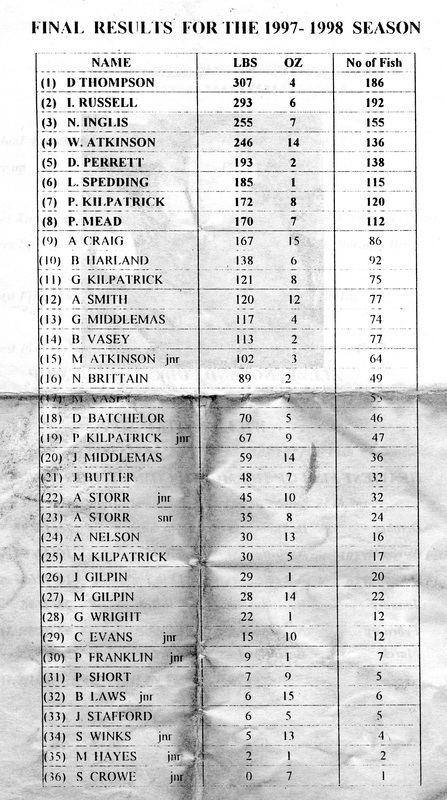 A cod of 20 lb 04 oz was weighed in at Whitby Angling & Shooting Supplies on Tuesday 24th February 1998. This was landed in daylight in the vicinity of Ravenscar, the angler P Westmoreland lives at Easington Colliery and fishes the areas around Whitby regular, the fish took a bait of silver white rag, also known as “snakes”. Due to a moderate west south westerly sea swell close to shore there were 50 fish weighed in for the Whitby Sea Anglers Association members mid-week match. The best catches were made on the soft ground along the beach near Sandsend as the cod were running in with the swells to feed on sand eels. 1st - Phil Mead - 14 lb 13 oz - 8 fish - his PB this season. 2nd - Neil Inglis - 9 lb 11 oz - 6 fish. 3rd - Bernard Vasey - 8 lb 12 oz - 7 fish. 4th - Ian Russell - 6 lb 06 oz - 4 fish. 5th - John Butler - 5 lb 15 oz - 4 fish. 6th - Paul Kilpatrick - 5 lb 07 oz - 4 fish. 7th - Dave Perrett - 5 lb 00 oz - 3 fish. 8th - Andrew Craig - 4 lb 02 oz - 2 fish. 9th - Brian Harland - 3 lb 08 oz - 3 fish. 10th - Philip Kilpatrick (Jnr) - 3 lb 08 oz - 2 fish. 11th - Mike Vasey - 2 lb 12 oz - 2 fish. 12th - Arthur Storr - 1 lb 14 oz - 2 fish. 13th - George Middlemas - 1 lb 14 oz - 1 fish. 14th - Adam Storr (Jnr) - 1 lb 12 oz - 1 fish. 15th - Glen Kilpatrick - 1 lb 02 oz - 1 fish. The sea swell remained through the week with reports of some good catches made along the beach on Saturday night tide, but the sea swell changed to a north easterly for Whitby Sea Anglers Association members match. With anglers going onto the hard ground of the scars to fish an ebbing to flood tide. This proved a good choice as the first for 4 members returned with double figure bags. 1st - Brian Harland - 14 lb 07 oz - 8 fish, heaviest fish . 2nd - William Atkinson - 13 lb 03 oz - 7 fish, including one over 4 lb. 3rd = Ian Russell - 10 lb 12 oz - 8 fish. 3rd = Denis Thompson - 10 lb 12 oz - 8 fish. 5th - Dave Perrett - 7 lb 10 oz - 4 fish. 6th - Bernard Vasey - 5 lb 06 oz - 4 fish. 7th - Phil Mead - 4 lb 10 oz - 2 fish. 8th - George Middlemas - 3 lb 03 oz - 2 fish. 9th - Mike Vasey - 3 lb 04 oz - 2 fish. 10th - Adrian Smith - 3 lb 03 oz - 1 fish. 11th - Jimmy Middlemas - 3 lb 03 oz - 2 fish. 12th - Mathew Atkinson (Jnr) - 2 lb 04 oz - 2 fish. 13th - Chris Evans (Jnr) - 1 lb 07 oz - 1 fish. Best bait at present is fresh lugworm both on the scars and beaches. The rough seas continued as a north westerly swell ebbed for Whitby Sea Anglers Association members but it was also a night of wind and showers for the first hour which spoiled casting. 1st - Bernard Vasey - 8 lb 03 oz - 4 fish. 2nd - Mike Vasey - 7 lb 11 oz - 4 fish. 3rd - Ian Russell - 6 lb 15 oz - 4 fish. 4th - Adrian Smith - 4 lb 13 oz - 3 fish. 5th - Denis Thompson - 4 lb 12 oz - 2 fish. 6th - George Middlemas - 4 lb 07 oz - 3 fish. 7th - Dave Perrett - 4 lb 03 oz - 3 fish. 8th - Andrew Craig - 3 lb 07 oz - 1 fish, heaviest fish of the night. 9th - Paul Kilpatrick - 2 lb 12 oz - 2 fish. 10th - Jimmy Middlemas - 2 lb 06 oz - 1 fish. 11th - Neil Inglis - 1 lb 15 oz - 1 fish. 12th - Arthur Storr - 1 lb 07 oz - 1 fish. There was just enough north by north westerly swell left for members of Whitby Sea Anglers Association to produce 5 double figure weights, one form junior Adam Storr (Jnr) - 11 lb 08 oz - 7 fish. 1st - Ian Russell - 11 lb 08 oz - 11 fish. 2nd - Neil Inglis - 15 lb 07 oz - 9 fish. 3rd - Paul Kilpatrick - 11 lb 13 oz - 7 fish. 4th - Adam Storr (Jnr) - 11 lb 08 oz - 7 fish. 5th - Andrew Craig - 10 lb 06 oz - 5 fish. 6th - Dave Perrett - 9 lb 12 oz - 6 fish. 7th - William Atkinson - 9 lb 06 oz - 6 fish. 8th - Phil Mead - 8 lb 03 oz - 6 fish. 9th - George Middlemas - 6 lb 08 oz - 4 fish. 10th - Glen Kilpatrick - 6 lb 00 oz - 4 fish. 11th - Philip Kilpatrick (Jnr) - 5 lb 12 oz - 3 fish. 12th - Denis Thompson - 4 lb 01 oz - 3 fish. 13th - Arthur Storr - 4 lb 01 oz - 2 fish. 14th - Adrian Smith - 3 lb 06 oz - 2 fish. 15th - Adrian Nelson - 2 lb 14 oz - 2 fish. 16th - Mathew Atkinson (Jnr) - 2 lb 12 oz - 2 fish. 17th - Bernard Vasey - 2 lb 11 oz - 2 fish. 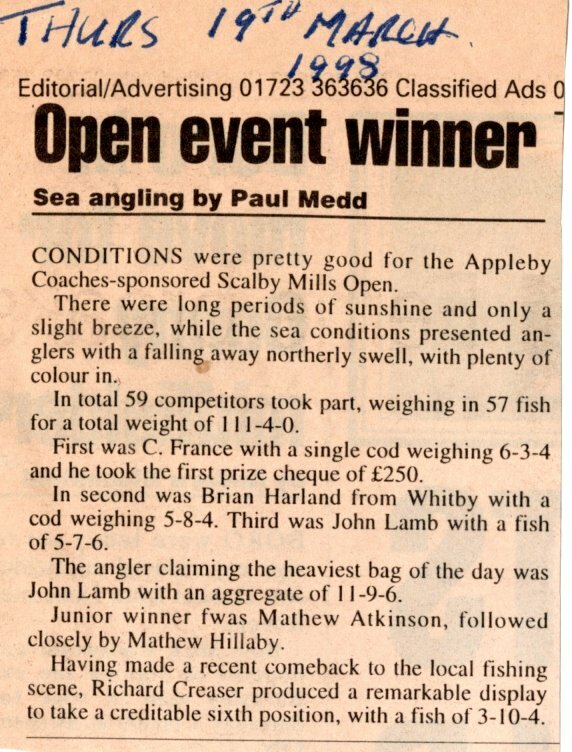 ​There was also an Open fishing competition held by Scalby Mill Angling Club on Sunday 15th March 1998, with a £250 prize for the heaviest fish going to Scarborough angler C France with a cod of 6 lb 03 oz, second place went to Whitby angler Brian Harland with a fish of 5 lb 08 oz. Winner of the Junior section was Mathew Atkinson (Jnr) also a member of Whitby Sea Anglers Association who is having an excellent season. Although there was a slight sea swell anglers from Whitby Sea Anglers Association caught a variety of types of fish which indicated a change in the sea state as the warmer weather and longer day light hours altered some of the marks that were producing good bags of fish. Sand dabs, billet, whiting and small codling were returned to the weigh in and Adrian Smith caught a bass. 1st - Paul Kilpatrick - 7 lb 10 oz - 5 fish. 2nd - Neil Inglis - 7 lb 02 oz - 5 fish. 3rd - Adrian Smith - 5 lb 14 oz - 4 fish. 4th - Dave Perrett - 5 lb 13 oz - 4 fish. 5th - Denis Thompson - 3 lb 09 oz - 3 fish. 6th - Andrew Craig - 3 lb 09 oz - 2 fish. 7th - Brian Harland - 2 lb 13 oz - 2 fish. 8th - Chris Evans (Jnr) - 1 lb 09 oz - 1 fish. 9th - Perry Franklin (Jnr) - 1 lb 05 oz - 1 fish. 10th - Phil Mead - 1 lb 02 oz - 1 fish. 11th - Philip Kilpatrick (Jnr) - 1 lb 01 oz - 1 fish. 13th - William Atkinson - 0 lb 11 oz - 1 fish. There were good reports of fish being caught on the west pier due to a north westerly swell on Friday and Saturday nights but a keen frost helped to calm the sea on a flooding tide for the Whitby Sea Anglers Association club match. Once again small codling were making an appearance with some anglers returning under-sized fish back to the sea. 1st - Ian Russell - 14 lb 10 oz - 11 fish. 2nd - Dave Perrett - 6 lb 14 oz - 6 fish. 3rd - Neil Inglis - 6 lb 09 oz - 5 fish. 4th - William Atkinson - 6 lb 07 oz - 4 fish. 5th = George Middlemas - 4 lb 00 oz - 3 fish. 5th = Brian Harland - 4 lb 00 oz - 3 fish. 7th - Denis Thompson - 3 lb 10 oz - 2 fish. 8th - Philip Kilpatrick (Jnr) - 3 lb 07 oz - 3 fish. 9th - Glen Kilpatrick - 2 lb 14 oz - 2 fish. 10th - Adam Storr (Jnr) - 2 lb 09 oz - 2 fish. 11th - Adrian Smith - 2 lb 02 oz - 2 fish. 12th = Arthur Storr - 2 lb 00 oz - 2 fish. 12th = Paul Kilpatrick - 2 lb 00 oz - 2 fish. 14th - Mathew Atkinson (Jnr) - 1 lb 13 oz - 2 fish. 15th - Phil Mead - 1 lb 12 oz - 1 fish. 16th - James Gilpin - 1 lb 09 oz - 1 fish. 17th - Bernard Vasey - 1 lb 06 oz - 1 fish. 18th - Mike Vasey - 0 lb 14 oz - 1 fine rockling which was weighed and returned alive. 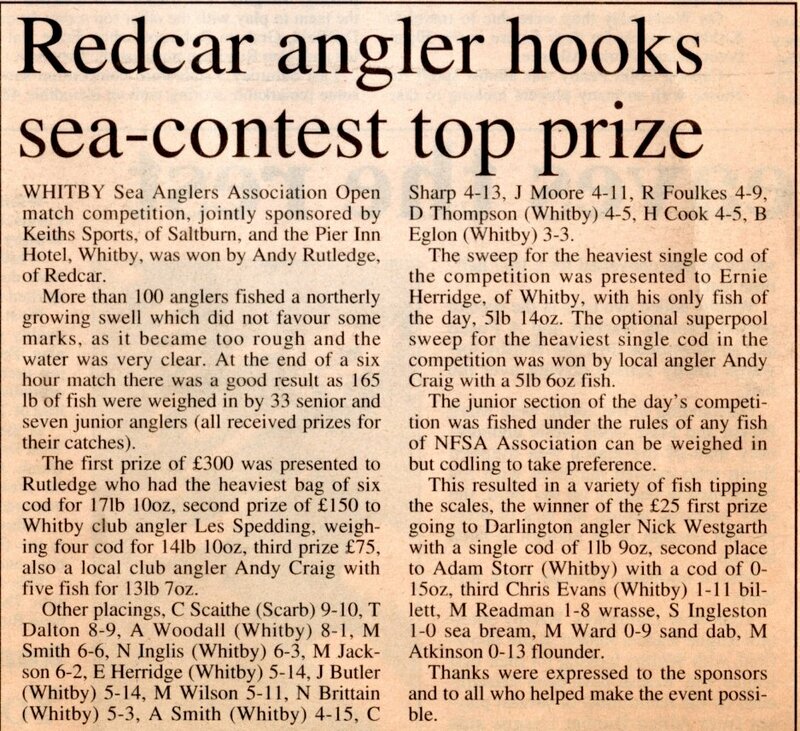 The penultimate match for Whitby Sea Anglers Association members as the season draws to a close. The last two matches were a “double win” for Phil Mead. It was a last hour to ebbing tide to a flooding tide match which produced a total of 50 fish with fish coming from the scars and the beach, the better fish from the scars. 1st - Phil Mead - 9 lb 15 oz - 6 fish. 2nd - Glen Kilpatrick - 8 lb 15 oz - 6 fish. 3rd - Neil Inglis - 8 lb 04 oz - 7 fish. 4th - George Middlemas - 7 lb 10 oz - 3 fish. 5th - Bernard Vasey - 5 lb 09 oz - 3 fish. 6th - Ian Russell - 5 lb 01 oz - 3 fish. 7th - Paul Kilpatrick - 5 lb 01 oz - 3 fish. 8th - Andrew Craig - 4 lb 14 oz - 2 fish. 9th - Philip Kilpatrick (Jnr) - 3 lb 01 oz - 3 fish. 10th - Brian Harland - 2 lb 09 oz - 2 fish. 11th - Denis Thompson - 2 lb 04 oz - 2 fish. 12th - Adam Storr (Jnr) - 1 lb 11 oz - 1 fish. 13th - Mathew Atkinson (Jnr) - 1 lb 09 oz - 1 fish. 14th - William Atkinson - 1 lb 06 oz - 1 fish. Dave Batchelor also caught a fish but was not entered in to the match - 1 lb 09 oz - 1 fish. The final match of the 1997 / 1998 season was fished from high water, 6 metre tide for a slight swell close to shore. With the clocks going forward, darkness arrived late for fishing the beach marks and it also tuned into a very wet night. 1st - Phil Mead - 6 lb 01 oz - 3 fish. 2nd - Dave Perrett - 3 lb 10 oz - 2 fish. 3rd - Ian Russell - 3 lb 07 oz - 3 fish. 4th - Neil Inglis - 3 lb 02 oz - 2 fish. 5th - Les Spedding - 2 lb 05 oz - 2 fish. 6th - Mathew Atkinson (Jnr) - 2 lb 00 oz - 2 fish. 7th - Adrian Nelson - 1 lb 15 oz - 1 fish. 8th = Dave Batchelor - 1 lb 09 oz - 1 fish. 8th = Denis Thompson - 1 lb 09 oz - 1 fish. 10th - Brian Harland - 1 lb 06 oz - 1 fish. 11th - William Atkinson - 1 lb 02 oz - 1 fish. 12th = Arthur Storr - 0 lb 15 oz - 1 fish. 12th = Mike Vasey - 0 lb 15 oz - 1 fish. 14th - George Middlemas - 0 lb 14 oz - 1 fish. 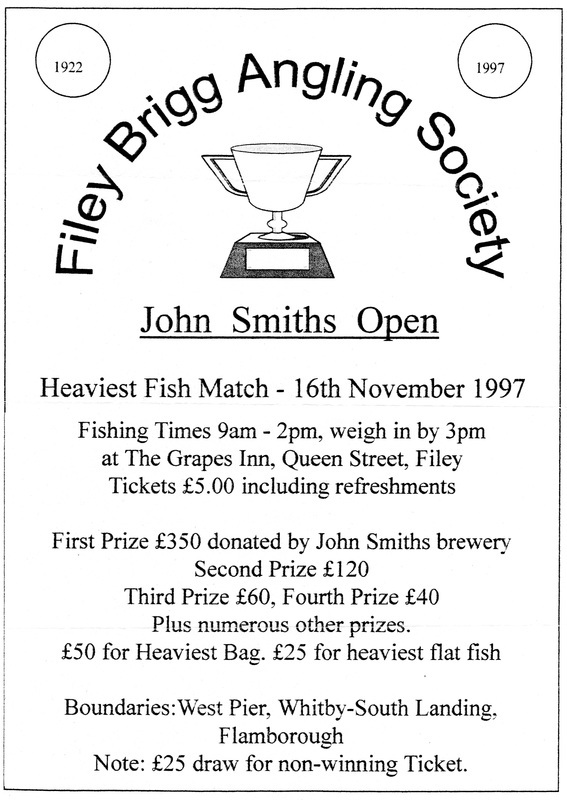 Next seasons Whitby Open will be held on the 8th November 1998.